The Sears Lewiston (ordered from Montgomery Ward) in Bowling Green, Ohio is threatened with immediate demolition. 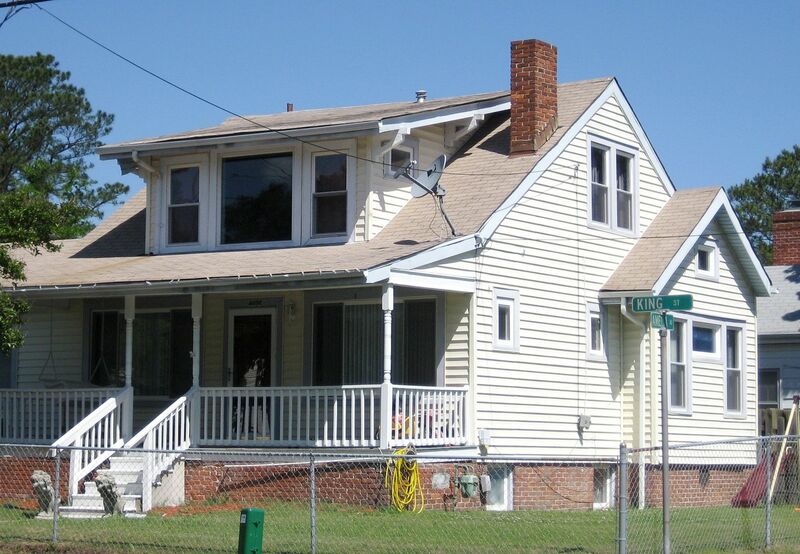 As of this writing (July 31, 2012), the house is scheduled to be razed on August 7th. 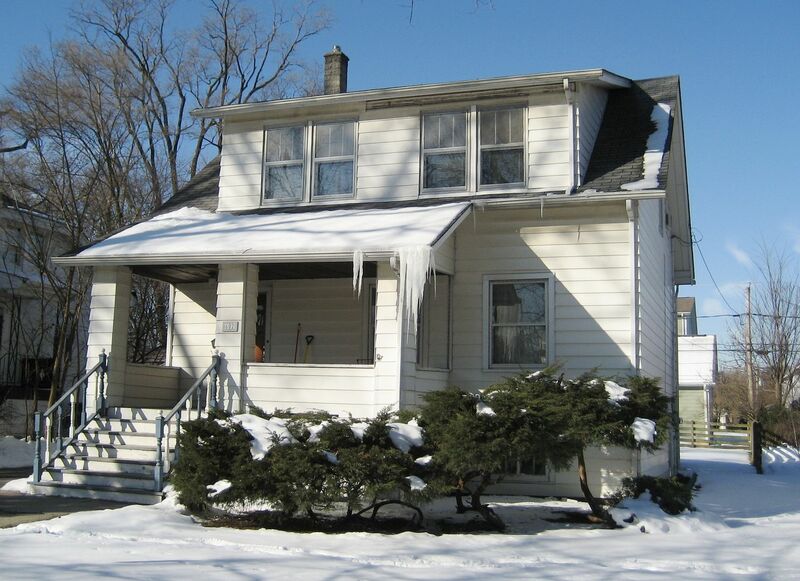 Click here to read Part I and Part II of this story, which gives more background on the house and its original buyer/builder. 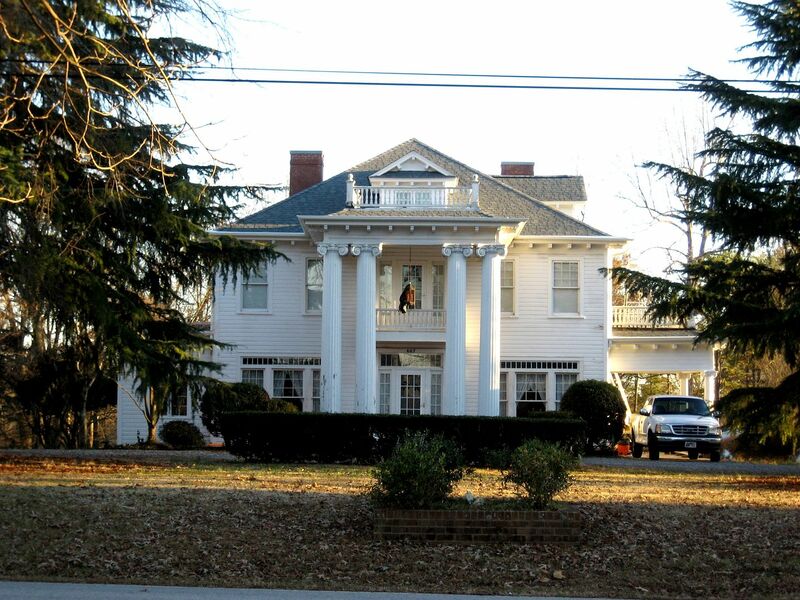 To sign a petition to help save the house, please click here. The goal is to garner 2,000 signatures. We’re getting very close. Your signature could make the difference. 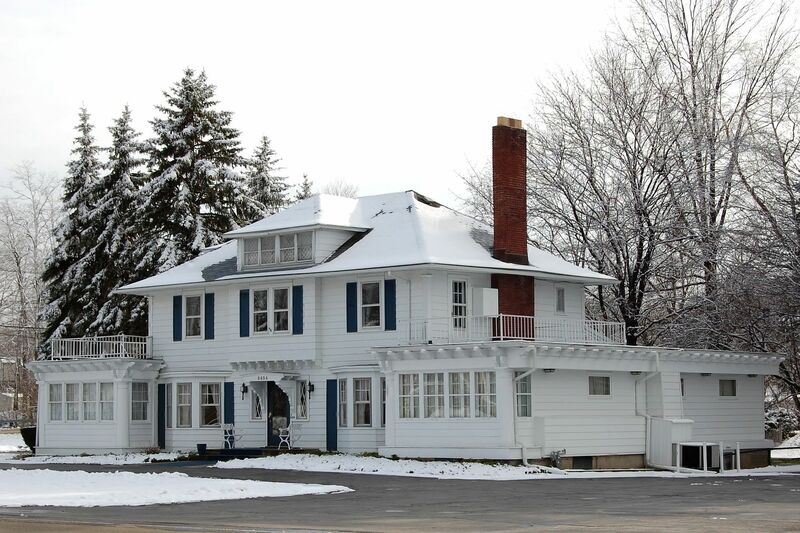 There are several reasons that this house is historically significant and should be saved. For one, it’s real rarity in the world of kit homes. We’ve now determined that this Sears Lewiston was not ordered from Sears, but from Montgomery Ward. 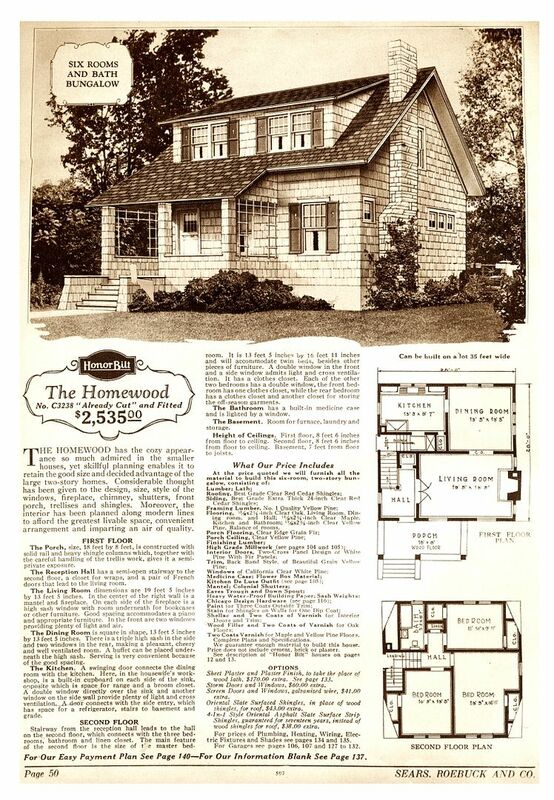 It seems likely that Virgil H. Taylor (the home’s buyer and builder) had connections at Montgomery Ward.. Perhaps he sent them the catalog page from the Sears Modern Homes catalog, featuring the Sears Lewiston, and asked Montgomery Ward to “custom build” that model - just for him. And apparently, they obliged. 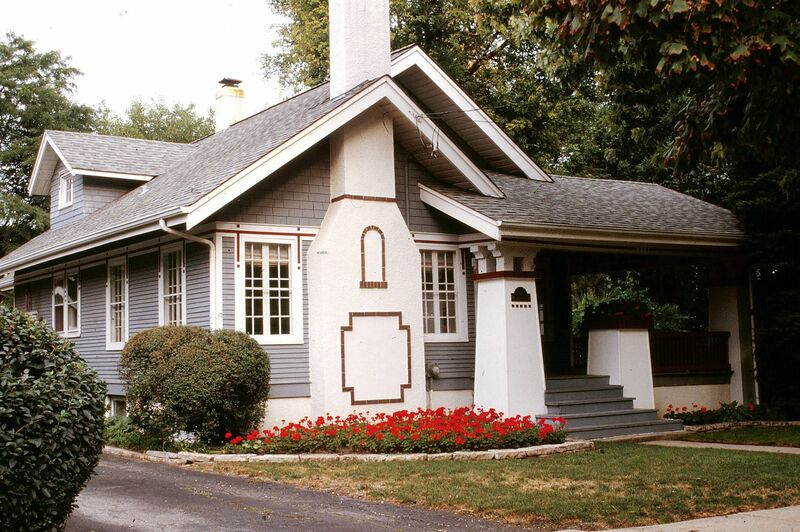 To learn more about why this house is a rarity in the world of kit homes, click here. 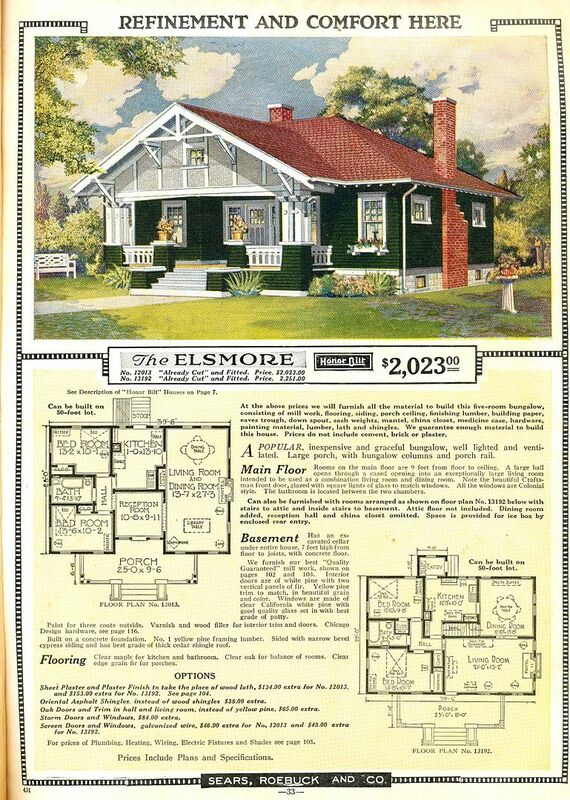 Sears sold about 70,000 kit homes during their 32 years in the kit home business. Wardway, by contrast, sold fewer than 25,000 kit homes. That’s one of the reasons it’s such a thrill to find a Wardway Home that was modeled after a Sears Lewiston. Wardway Homes are a limited edition. 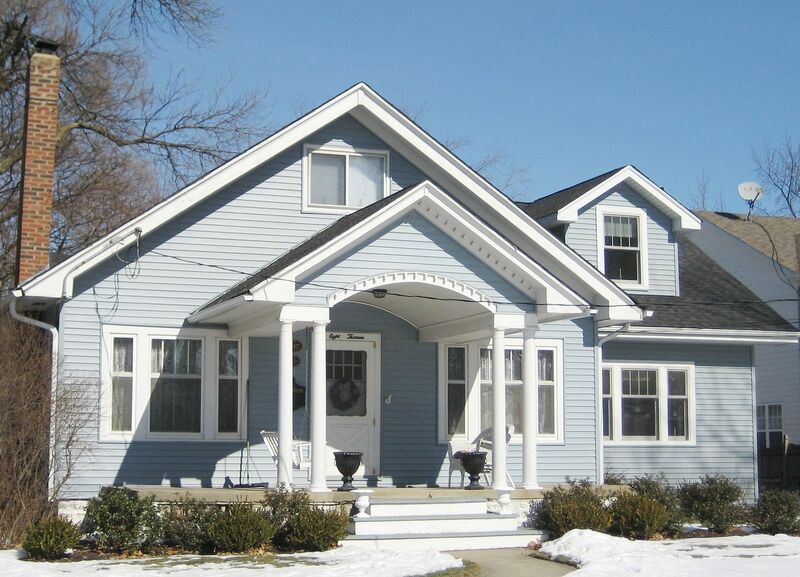 How many Wardway Homes are there that are a perfect replica of a Sears Lewiston? Probably just one. And unless BGSU reverses its decision to destroy this house, it’ll soon be just another pile of rubble sitting at the landfill. 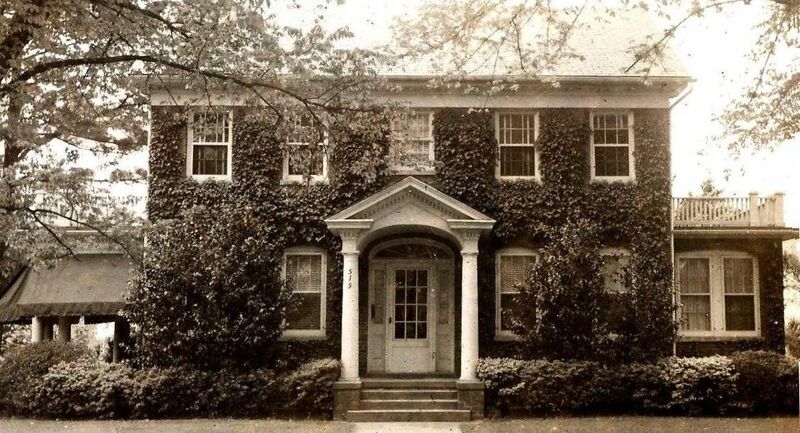 Enjoy the photos that tell the story of Virgil’s custom-built Wardway Home. Designed by Sears. Copied by Wards. 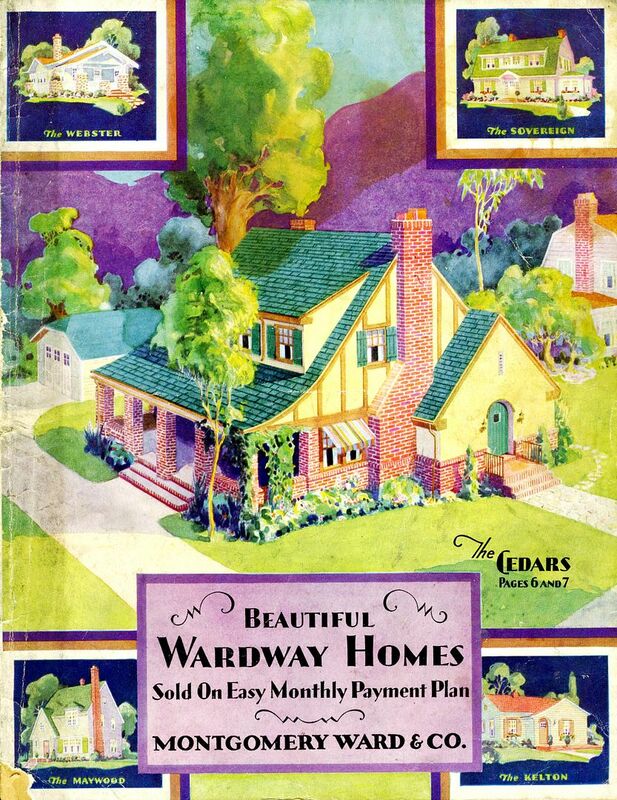 Unlike most Wardway Home buyers, Virgil didn't start with the Wardway Catalog. He started with the Sears catalog. Virgil seemed to have fallen in love with a model found only in the Sears Modern Homes catalog, The Lewiston. 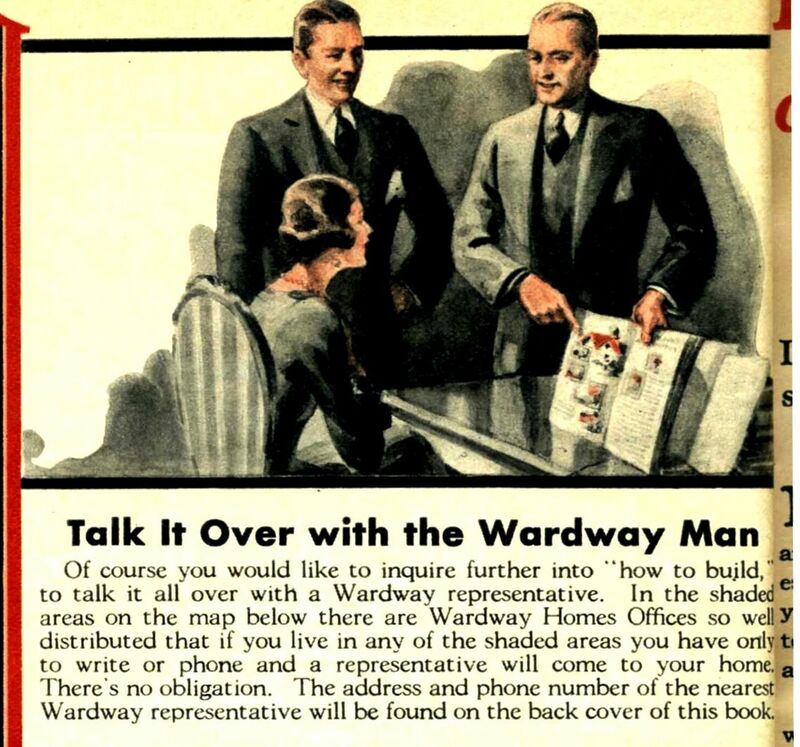 In the Wardway catalog, Montgomery Ward promised that "custom designs" were no problem. But the small print didn't say anything about designs from Sears and Roebuck! All Wards needed was a photo, which Virgil may have cut out of the Sears Modern Homes catalog. This is what makes Virgil's house such a treasure. It came from both Sears and Wards - in a way! In my 12 years of searching, I've only found two other instances where this occurred. There in Ohio, Montgomery Wards had "a complete unit of our Field Service Organization to work with people like Virgil. Maybe Virgil got to meet "The Wardway Man," who bore a stunning resemblance to James Cagney. 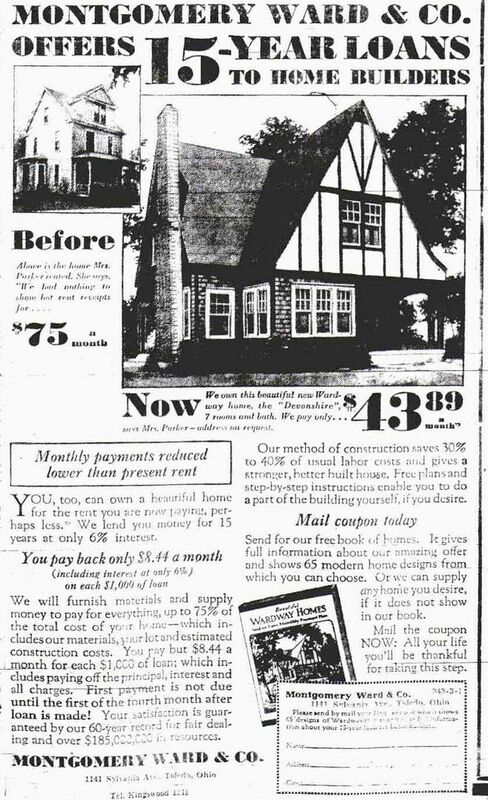 Virgil was building a custom home - from the standpoint of Montgomery Ward. And while it was patterned after the Sears Lewiston, it would be outfitted with several tell-tale Wardway features, such as door hardware, millwork, plumbing fixtures, etc. 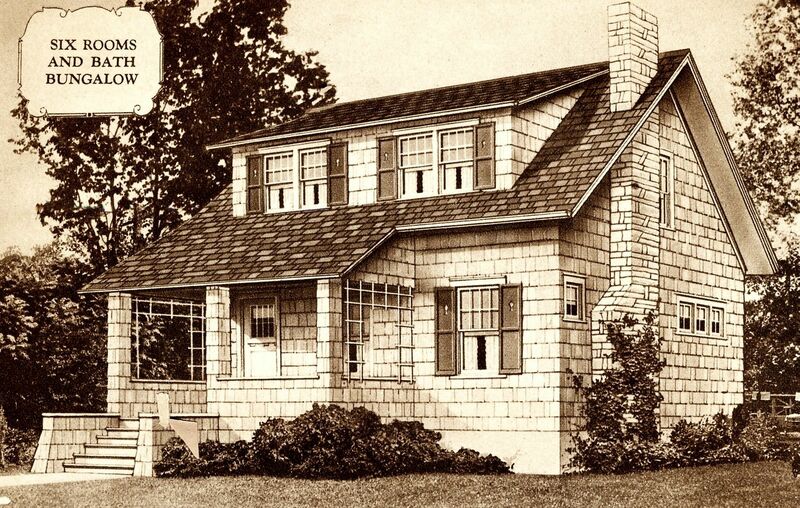 When Virgil's house arrived in late 1931, Virgil pored over the 70+ page instruction book, struggling to figure out how to turn that 12,000-piece kit into something resembling a house. Virgil obtained a Wardway mortgage for his Wardway home. The 15-year mortgage came with a 6% interest rate and (typically) 25% down payment. The lot could suffice as the 25% down payment. The lot was apparently a gift from Virgil's father. This story is interesting for so many reasons, and here's a biggie. 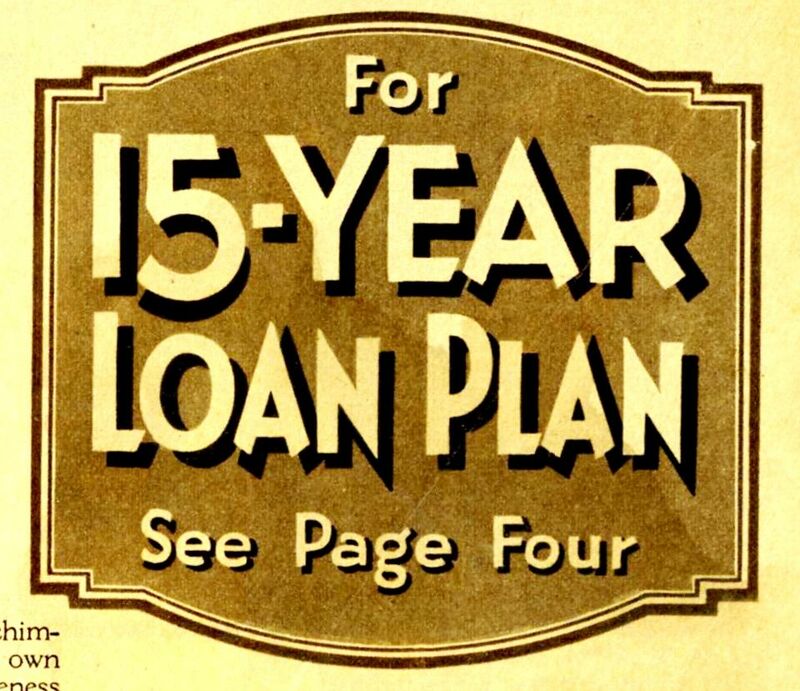 Virgil worked for the "Sentinel Tribune" as an advertising rep. And on March 1, 1932, a couple weeks before Wardway Homes closed down, this ad appeared in the Sentinel Tribune. I'm not even sure what to make of that. 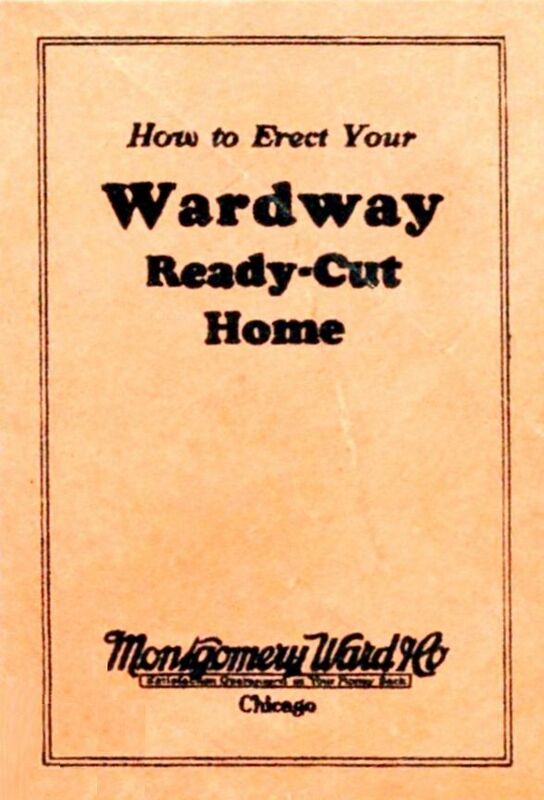 Montgomery Ward had a requirement that the house be "substantially complete and ready for occupancy four months" after materials were received. 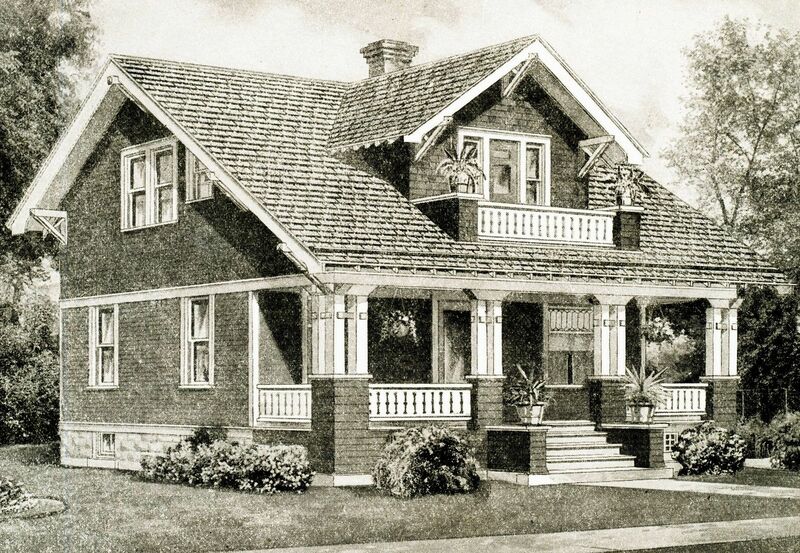 Virgil's 12,000 pieces of house were delivered to the Bowling Green train station in early November 1931. This picture was taken soon after the house was completed. In the foreground, you can see that the yard has not been landscaped or seeded. Wardway did good. Virgil's house was a spot-on match to the Sears Lewiston. Pretty darn impressive, in fact. And I *love* it that the house in the old photo was taken from the SAME angle as the Sears Lewiston. Wardway Homes were quite elegant. 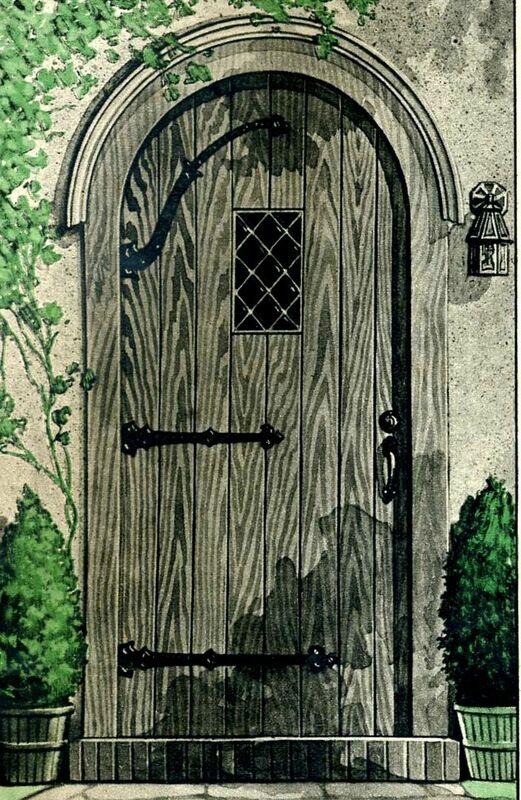 They did have pretty doors. 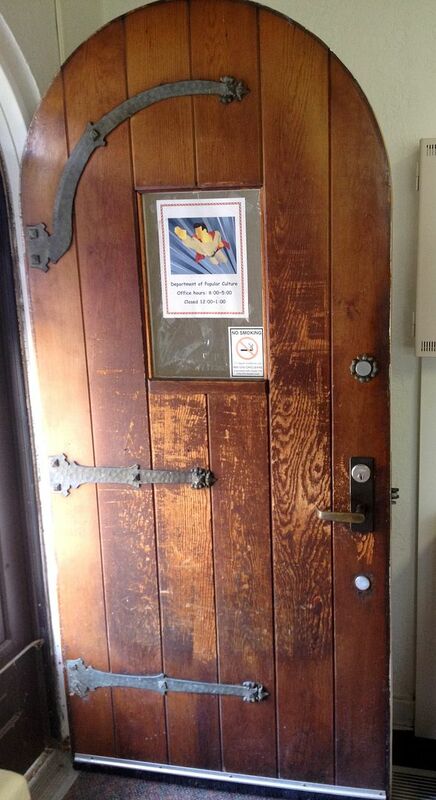 And here's the door that ended up on Virgil's "custom-designed" Wardway Home. 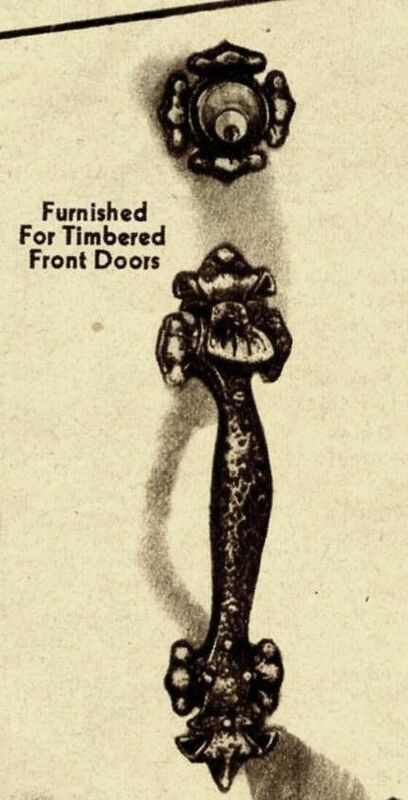 I love the detail given in the catalog images (1931 catalog). 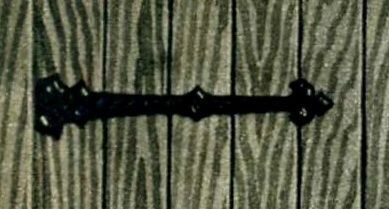 The original lock set (1931 catalog). hThese were solid homes, made with first-growth lumber from virgin forests. It's a quality of lumber and building materials that we will never again see in this country. To send it off to the landfill is a sin. Today, Virgil's house is threatened with demolition. 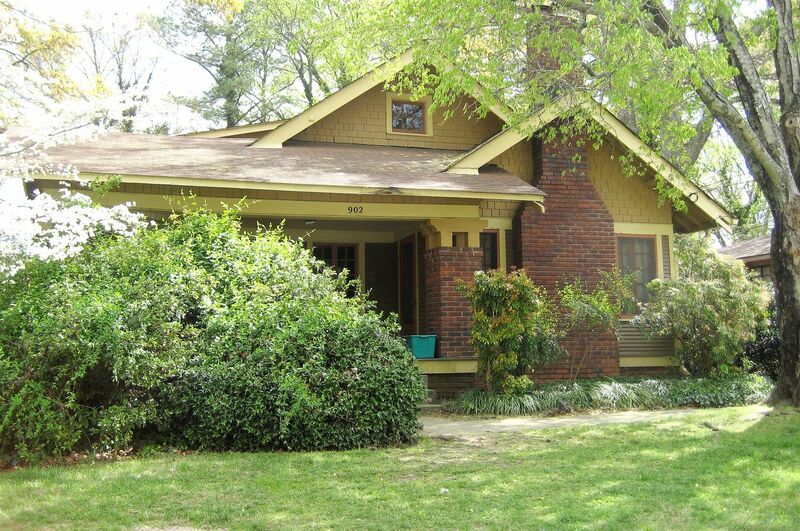 Please visit the link at the top of the page and sign the petition that can HELP save this house. Photo is reprinted courtesy of The Blade, Toledo, Ohio. According to “The Slate Roof Bible” (Joseph Jenkins, 2003), construction and demolition debris make up 28% of the volume at landfills. 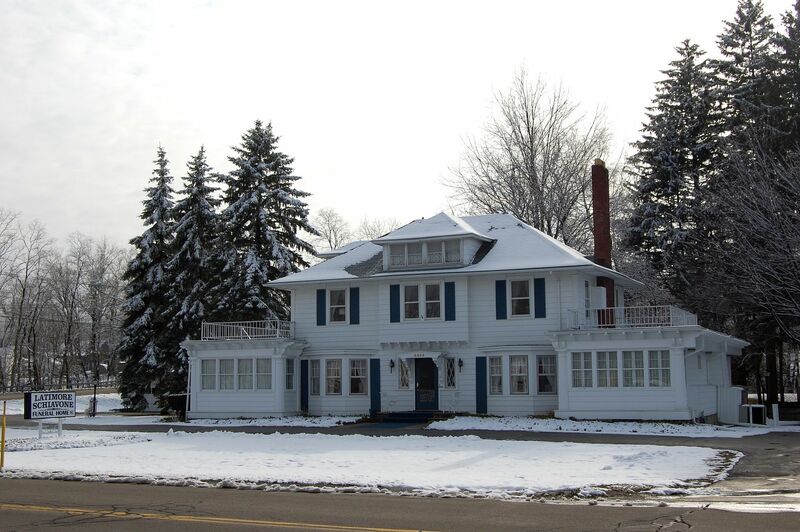 The “greenest” thing that BGSU can do is to restore the house and let it remain at its current location. The second greenest thing would be to relocate the original structure to another site. One thing is for sure: Our landfills do *not* need another historically significant house. Click here to read Part I and Part II of this blog. Update!! This house is now scheduled for demolition on August 7th. Click here to read the latest! 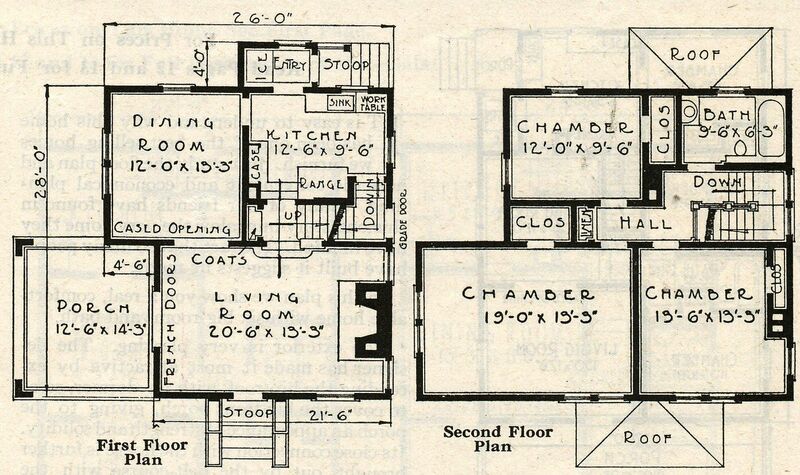 A Sears House from Montgomery Ward? Yes, it’s true! But the sad news is, it’s slated for immediate demolition. According to an article that appeared in the Toledo Blade, Bowling Green State University has decided that the house must go. A specific date hasn’t been given, but the school wants the building gone before classes begin on August 20th. 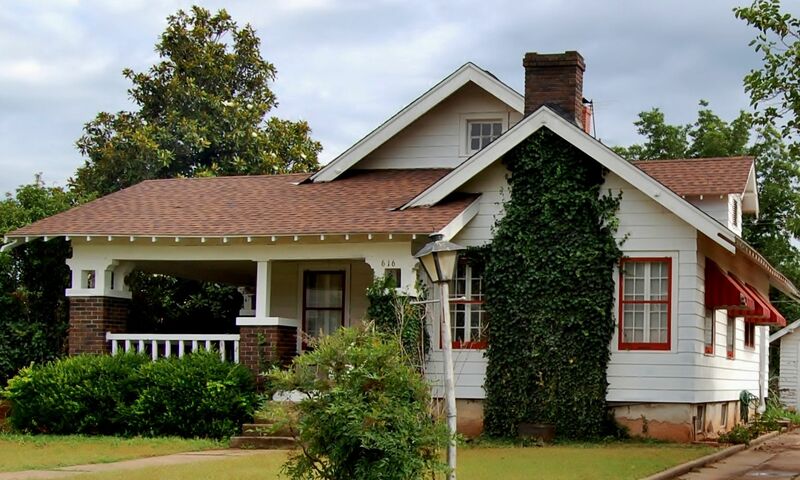 An online petition has been created in the hopes of saving This Old House. Please sign the petition by clicking here! And in my professional opinion, this house should be saved. 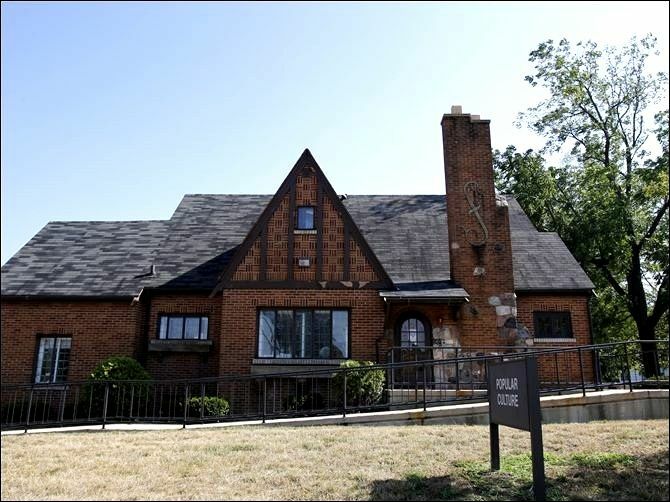 This little Neo-Tudor in Bowling Green should be saved for two additional (and uniquely compelling) reasons. 1) The personal story about how this house came to be: This kit house was purchased from Montgomery Ward in late 1931 or very early 1932. 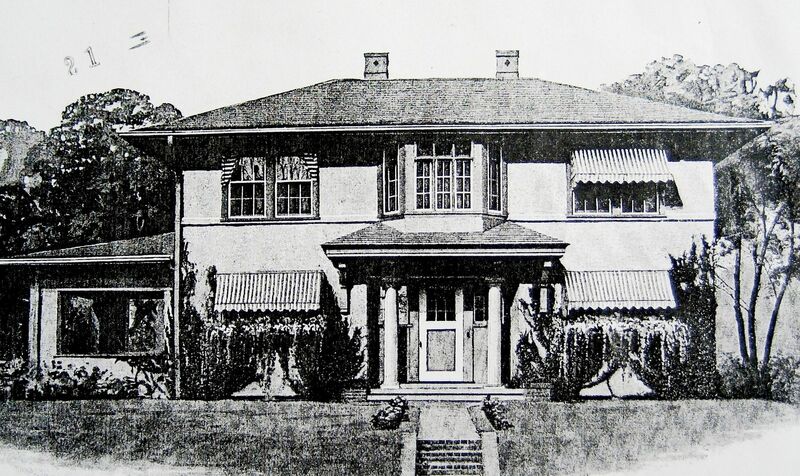 The home’s buyer was Virgil Taylor, the son of Jasper and Mae Taylor. Jasper Taylor was the County Treasurer. Virgil built this kit home on a lot that he’d been gifted by his parents. Imagine, hauling 12,000 pieces of house from the train depot in Bowling Green to the building lot. That, in and of itself, was a monumental task. In 1936, the Great Depression must have hit Virgil hard. He lost the house to foreclosure, and it went back to Montgomery Ward. 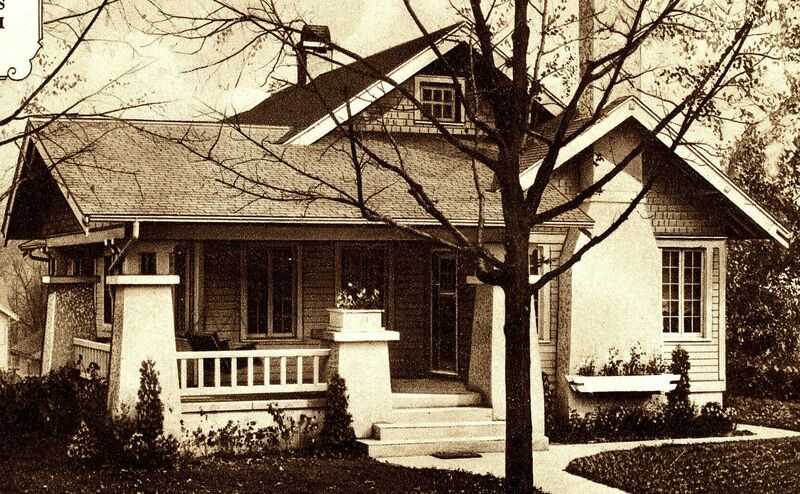 For a short time, Montgomery Ward rented out the little house and then it was sold to the college in the late 1930s. This is an amazing story because it’s an encapsulation of life during the the early 1930s. Dad wants to help son get a start in life. Dad gives son a free lot. Son buys a kit home, and working nights and weekends, he builds the house. As he builds it (probably working side-by-side with Dad), both men think about the security that “a home of his own” will give to young Virgil. As he painstakingly drives in each of the many nails in this kit (about 750 pounds of nails), he thinks about growing old in this house, and maybe someday bringing a wife and child into his “home.” And then the Great Depression hits and Virgil loses everything, including his beloved home and the lot his parents gave him. And the happy memories of working with Dad. And the joy of building something with his own hands. And all the faith and hopeful expectation about his future, secure in a home of his own. All of it gone, washed away by the economic tsunami of the 1930s. Losing a house is hard. Losing a home that you built with your own two hands must be excruciating. Now that’s a compelling story, but there’s yet another reason that this house has captured my fancy. 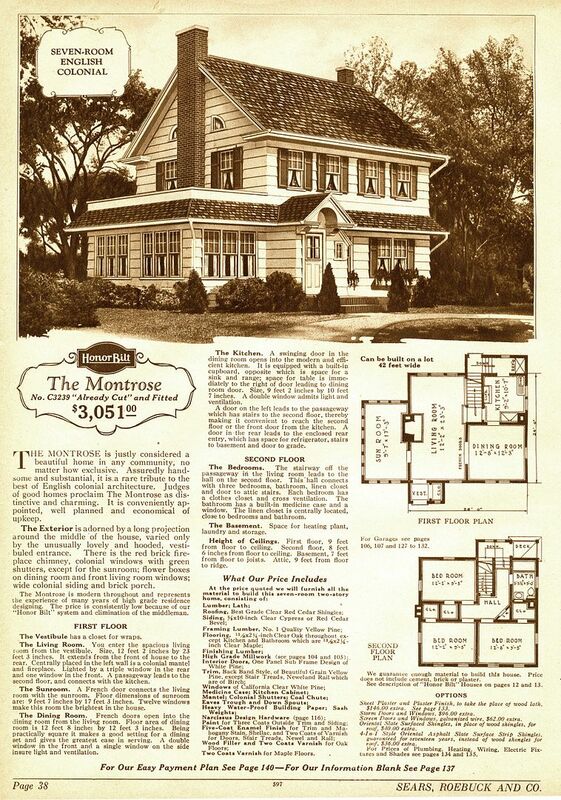 2) Virgil’s house is a Sears kit home (The Lewiston*) and yet it was ordered from Montgomery Ward. This is not unheard of, but it is pretty darn unusual. Apparently, Virgil fell in love with the Sears Lewiston and yet - for reasons we haven’t discovered yet - had an allegiance or connection to Montgomery Ward. 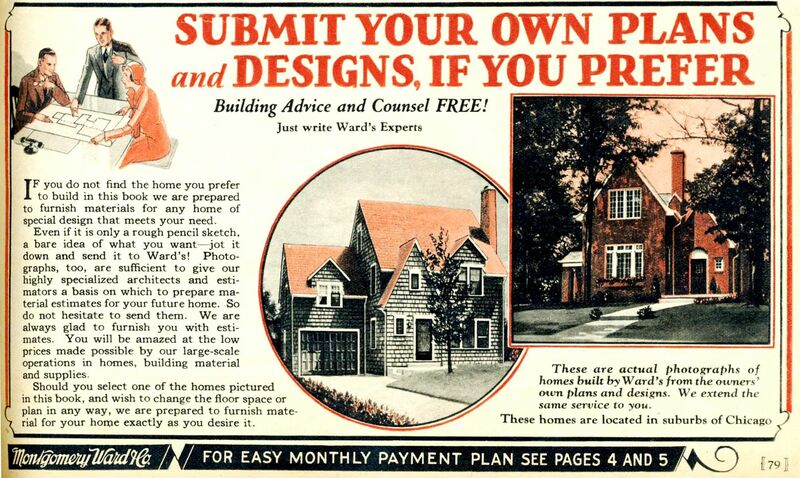 Virgil apparently sent a photo of the house to Wards and asked them to build him this Sears House. 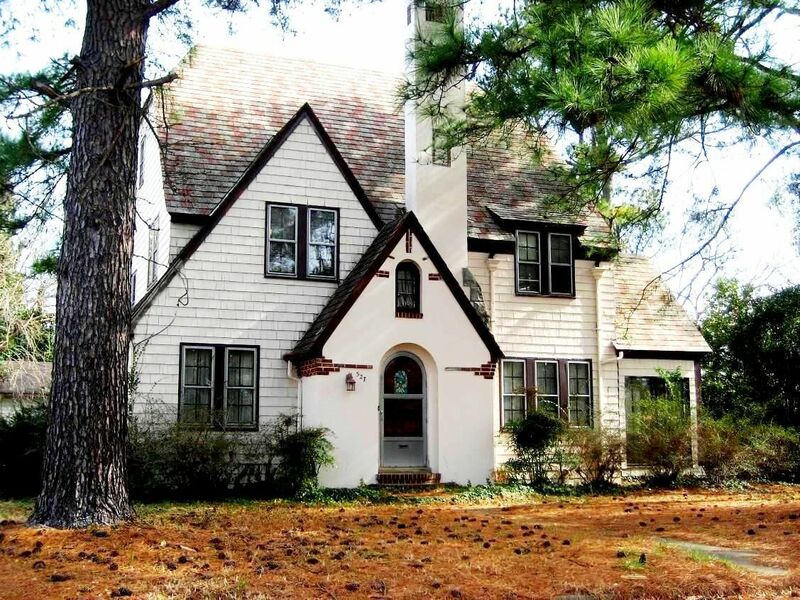 When I first heard that this was a Montgomery Ward house, I was a tiny bit incredulous. 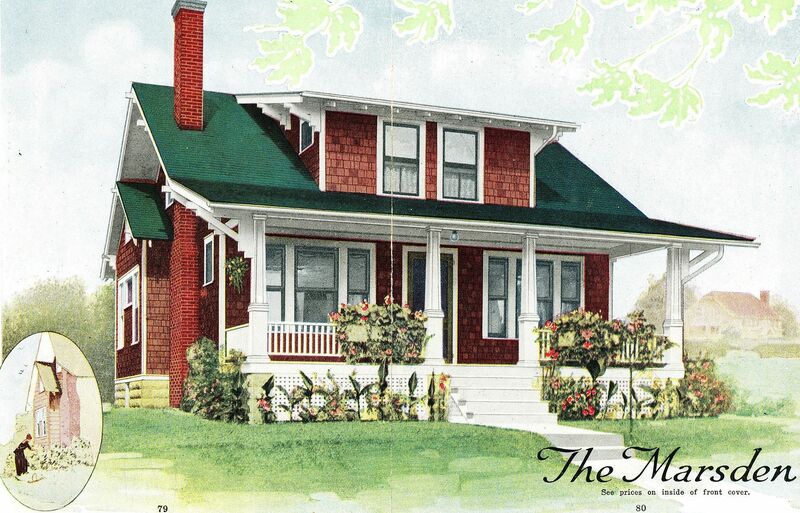 Dale Wolicki and I co-authored a book (”Mail-Order Homes of Montgomery Ward”), and I can tell you, they never offered a kit home that looked anything like the Lewiston. And then Raymond I. Schuck sent me some photos (shown below). This house was ordered from Montgomery Ward. But it’s not a Ward’s house. Our priority is saving this house, so please - before you gaze upon the awesome photos below - take a moment and sign this online petition. Please forward this link to every old house lover you know and ask them to do the same. Post the link on your Facebook page. Tweet this page. Spread the word. This online petition is easy to use and loads fast. This won’t take more than 60 seconds of your time. * The persistent asterisk is because I’m not sure how to label this house. It’s a Sears Lewiston, ordered from Montgomery Ward. This is the Sears Lewiston (ordered from Wards) that is slated for demolition at Bowling Green State University (Toledo). Photo is reprinted courtesy of The Blade, Toledo, Ohio. The Sears Lewiston, as seen in the 1930 catalog. Lumber inside this "Sears Lewiston" states that the house was ordered from Montgomery Ward & Co., Davenport, Iowa. 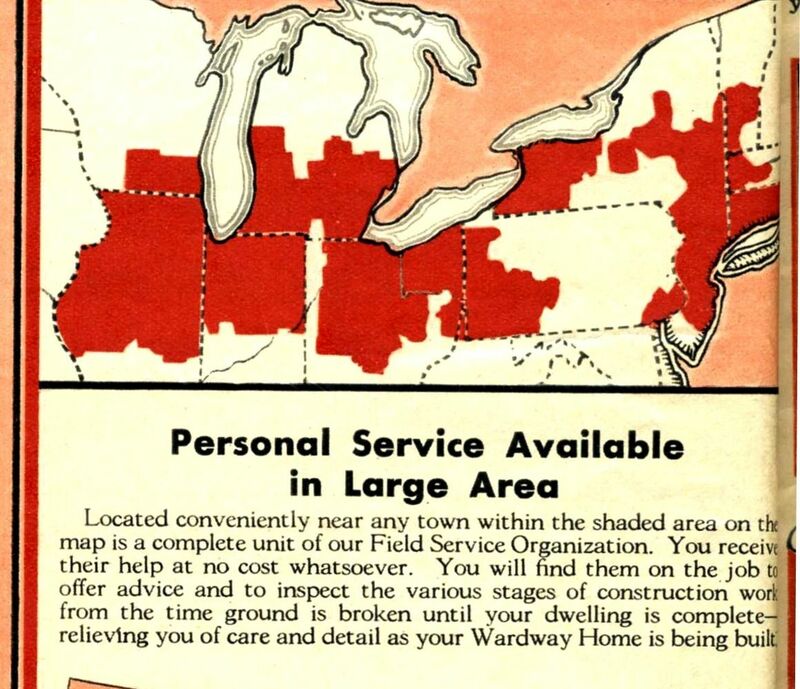 Unlike Sears, Montgomery Ward did not have a "Modern Homes Department." All orders for Wardway Homes were turned over to Gordon Van Tine (yet another kit home company) for fulfillment. Photo is copyright 2012 Raymond I. Schuck and can not be used or reproduced without written permission. 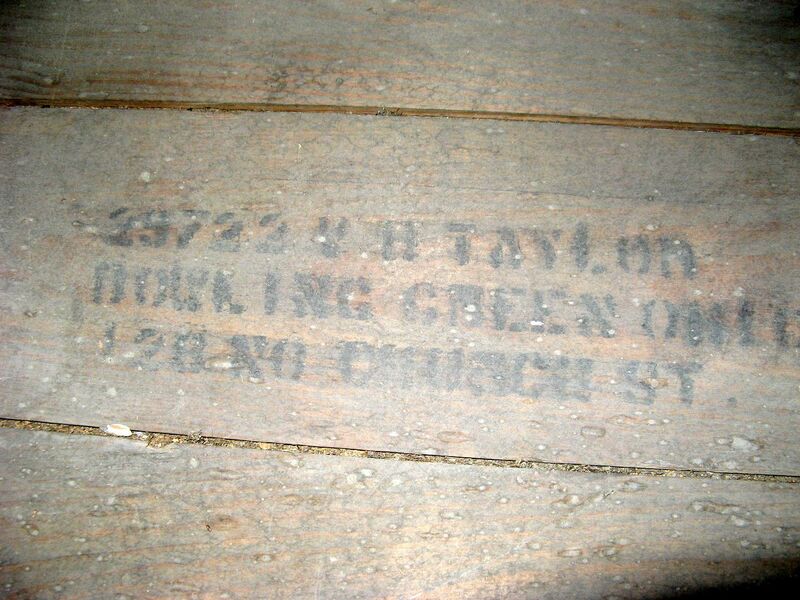 Another piece of lumber shows that the house was shipped to the train depot at Bowling Green, Ohio. The address (128 No. Church Street) was Virgil's home at the time. He lived with his parents prior to building this house. The number (29722) is probably a model number, but it could be an order number. Next to the number is Virgil's name! "V. H. Taylor." Photo is copyright 2012 Raymond I. Schuck and can not be used or reproduced without written permission. Ah, but it gets even better. 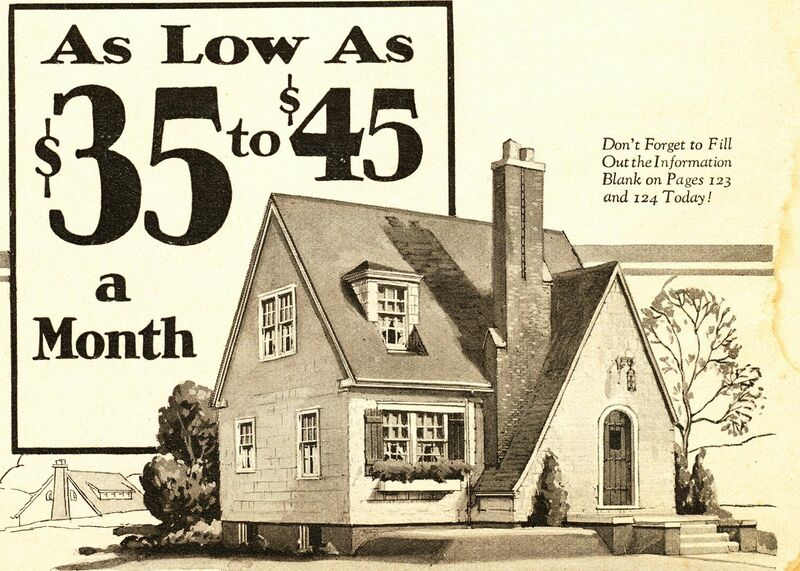 Bowling Green is home to several kit homes, including the Sears "Willard" shown in this promotional advertisement from 1928. And here is the Willard in Bowling Green! What a beauty! How many Sears Homes are in Bowling Green? Several. Photo is copyright 2012 Dale Wolicki and can not be used or reproduced without written permission. 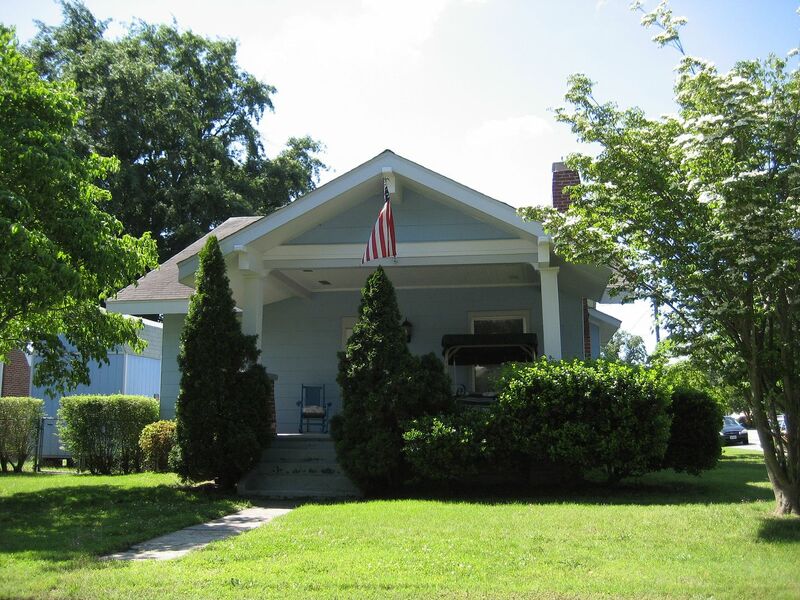 Tomorrow, I’ll write a blog showcasing a few of the kit homes that Dale found in Bowling Green. To read one of the many reasons that I think this house should be saved, click here. 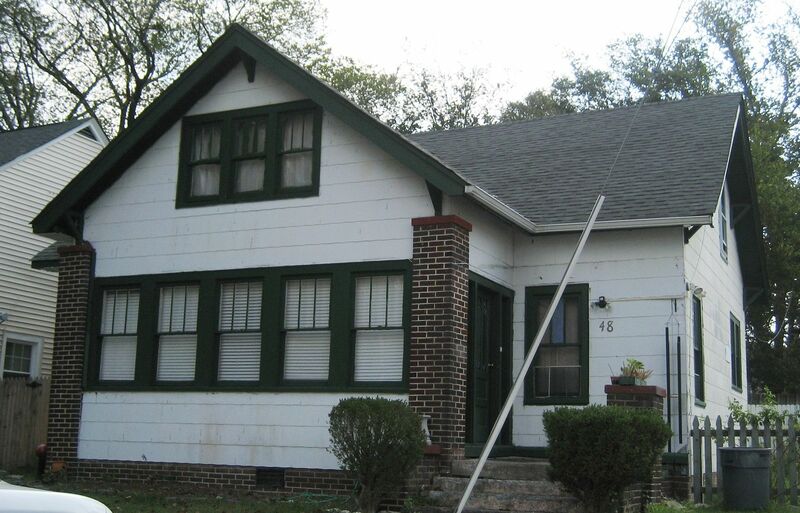 Do You Have 60 Seconds to Save a Sears House? Updated! This house is now scheduled for demolition on August 7th. Click here for the latest!! Bowling Green State University (Toledo area) has decided to demolish a Sears House to make way for an expansion. 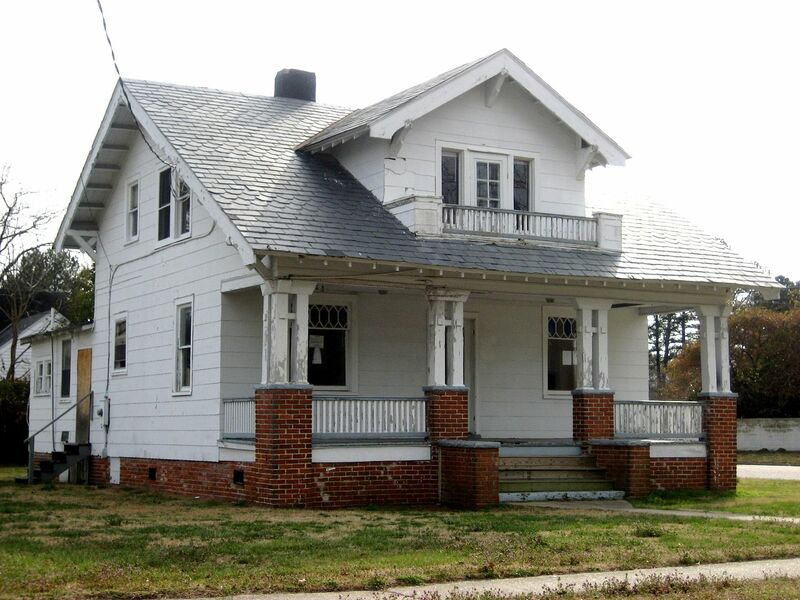 Please - take a moment and sign this on-line petition and cast a vote in favor of saving this Sears House. This online petition is easy to use and loads fast. This won’t take more than 60 seconds of your time. How many early 20th Century kit homes have been swallowed up by this very type of academic expansion? I’ve already got a plethora of PHOTOS of Sears Homes that were torn down to make way for some new plasticine palace or a college expansion or a new big-box store. Too often, these “new” buildings lack the structural integrity and/or visual aesthetics to endure more than three or four decades - at best. The Sears Lewiston that’s now standing on the BGSU campus has been there for more than 80 years. Why destroy it now? Sears Homes are a limited edition. 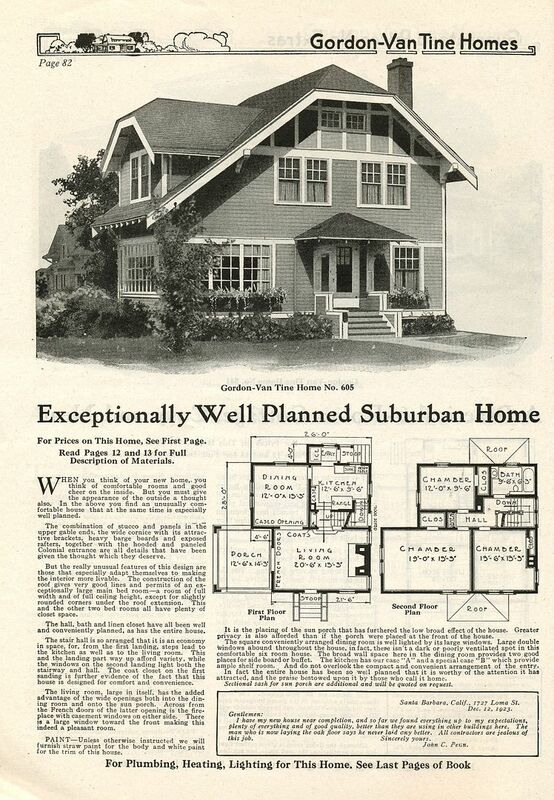 From 1908-1940, Sears sold about 70,000 kit homes in all 48 states. 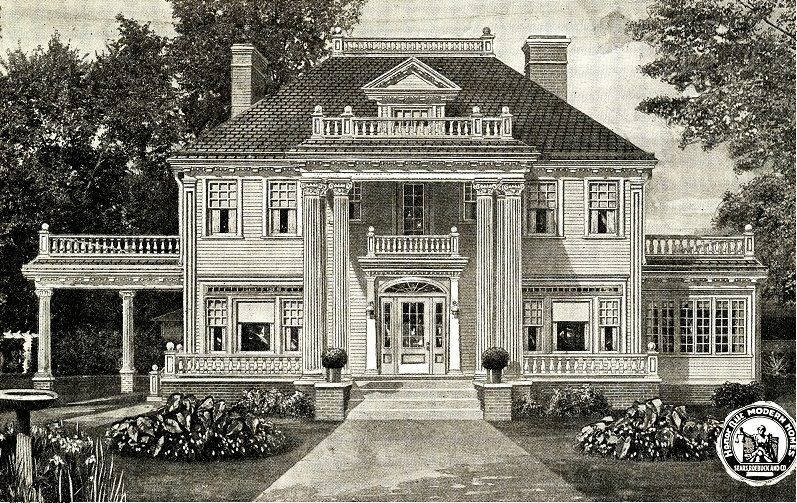 Of the 370 designs that were offered, the Sears Lewiston (the house under the wrecking ball now) was one of their finer homes. There are alternatives to destroying this house. If the house is in the way, then MOVE IT to another location. 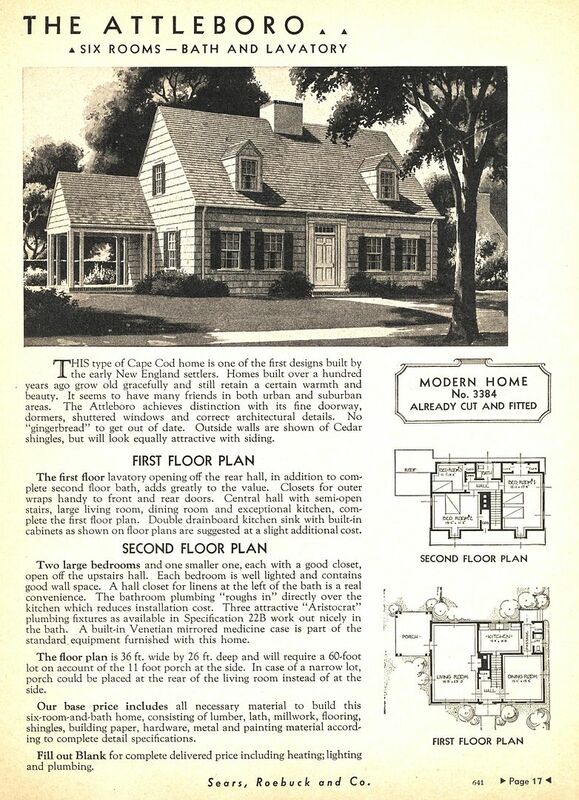 Sears Homes were made with first-growth lumber harvested from virgin forests. The quality of building materials in these houses is remarkable, and we’ll never see wood of this quality again. Why send all this to the landfill? This is one of those “Fun Causes” that costs you very little time and yet has the potential to yield great benefits. 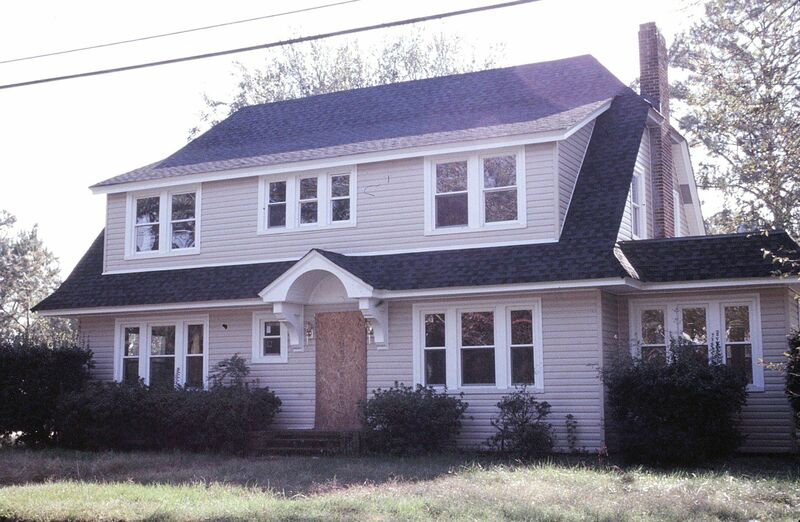 Please take a moment and sign the petition that will save this house from demolition. And please share this link with others. 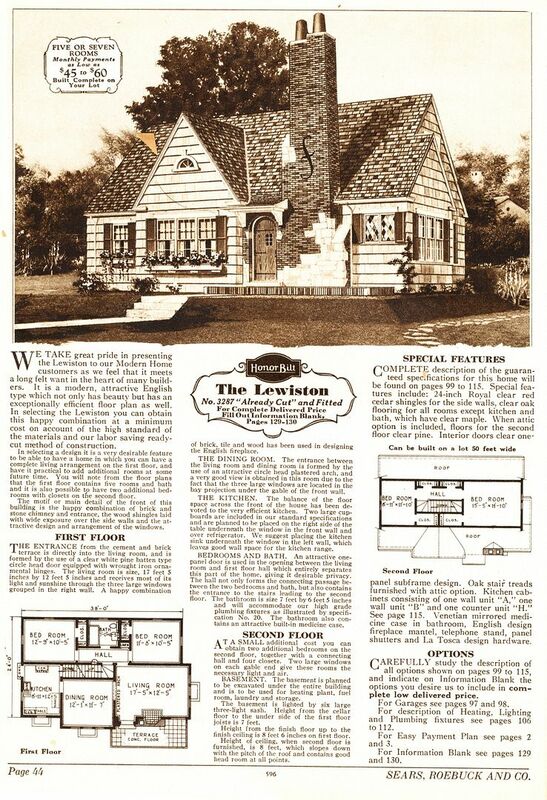 Click here to read more about the Sears Lewiston. This is the Sears Lewiston that is slated for demolition at Bowling Green State University (Toledo). Photo is reprinted courtesy of "The Blade," Toledo, Ohio. To read the full article from The Blade, click here. The Sears Lewiston, as it appeared in the 1930 catalog. This Lewiston in Dowell, Illinois is in pretty good condition, despite some period-inappropriate remodeling. Typically, you don't see fretwork on Neo-Tudors. A perfect Lewiston in Oconomowoc, Wisconsin. This Lewiston is in another college town - Champaign, IL. An update! Someone from the school has contacted me and reports that there are markings on the lumber, suggesting that this Sears Lewiston was ordered from Montgomery Ward (and fulfilled by Gordon Van Tine). Read the comments below to get the whole scoop. Quite a story! And quite a house! To learn more about kit homes from Montgomery Ward, click here. Second update: Several people have written to say that the house at BGSU is a Sears Colchester. 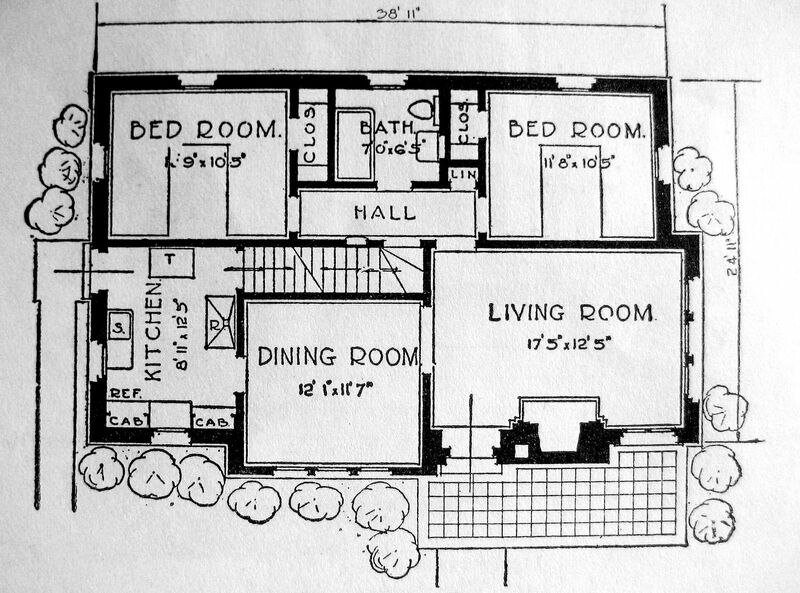 The Colchester and the Lewiston were identical homes, but the Colchester was offered in brick and the Lewiston was a frame house. That’s it. 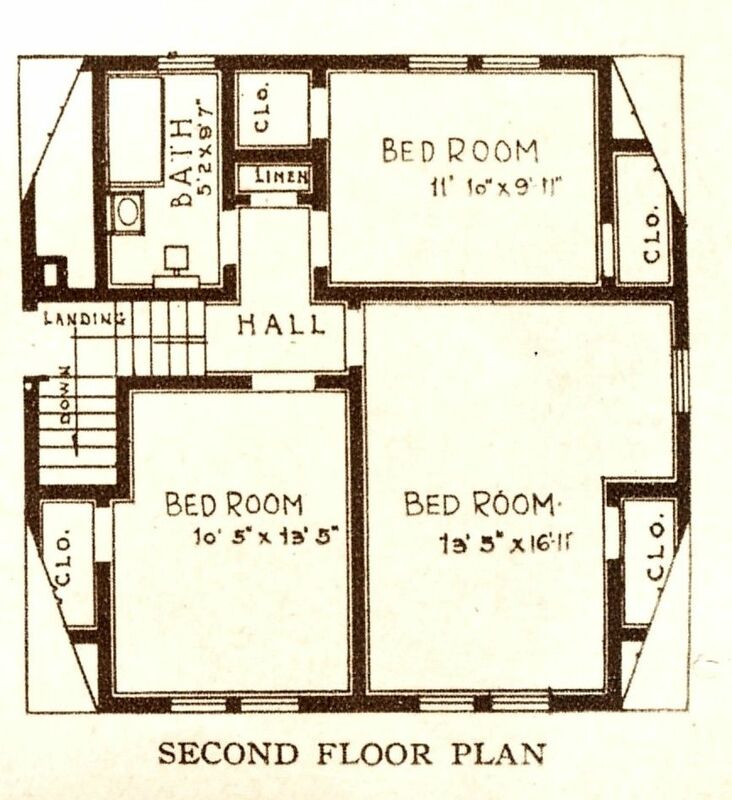 The Colchester’s footprint was 11″ wider and 11″ deeper, because it had brick veneer. Other than this minor difference, these two houses were the same house, with a different name. 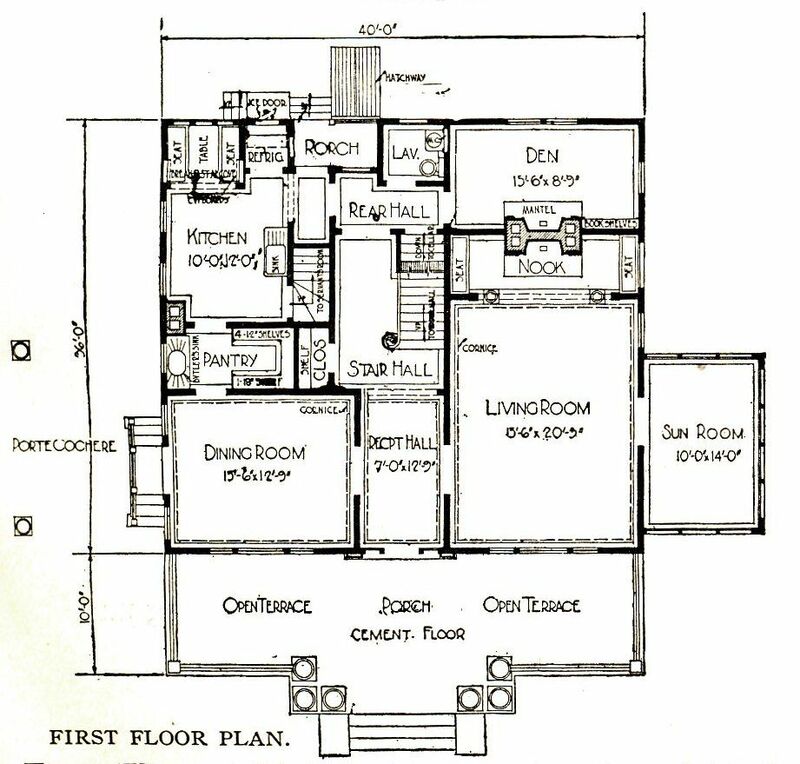 If you look at the floorplan below, you’ll see it’s a perfect match to the floorplan for the Lewiston. 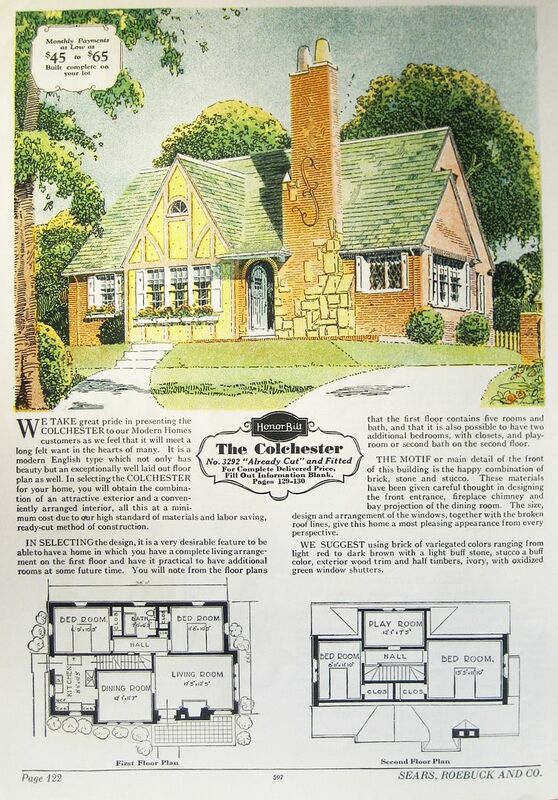 The Colchester was offered in the 1930 catalog, but it was identical to the Lewiston. The room layout in the Colchester was identical to the Lewiston. Due to the brick siding, the Colchester was 11" wider and deeper. Comparison of the Colchester (1930) and the Lewiston (1928). Please visit this link to sign the petition. 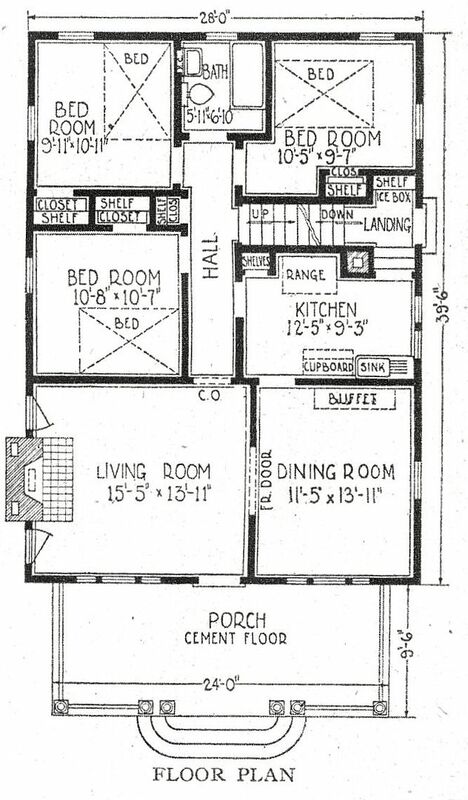 As the “Tiny House” grows in popularity, I’m forever surprised that some of these old Sears designs are not being re-invented and re-created. Some of the designs - such as the Avalon - are just as pretty as they can be, making optimal use of small spaces. In the 1920s, apparently many other folks thought so, too. The Avalon was offered from 1920 - 1928, and judging by the number of these found in America’s cities, this was a popular design for Sears. Looking at the photos below, I’d love to know - how many of these Avalon homeowners knew that they had a kit house? 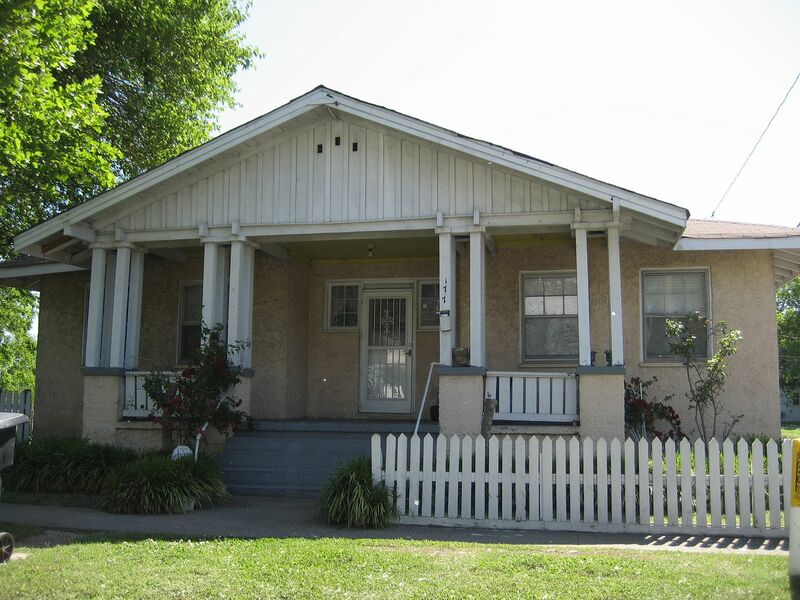 To learn more about bungalows, click here. 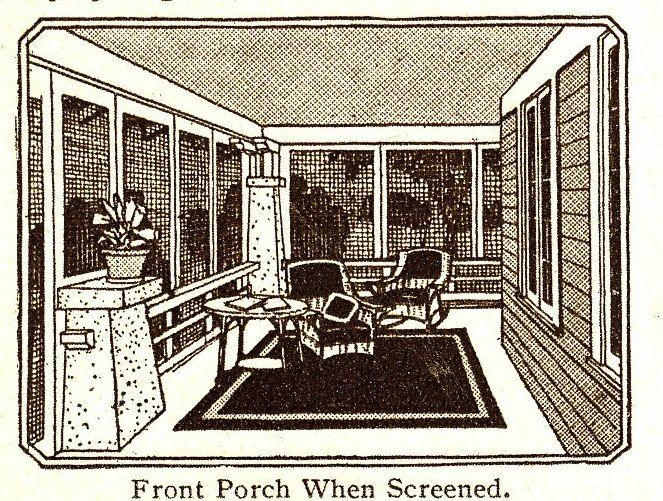 In the 1928 catalog, they showed this image of a screened-in porch. 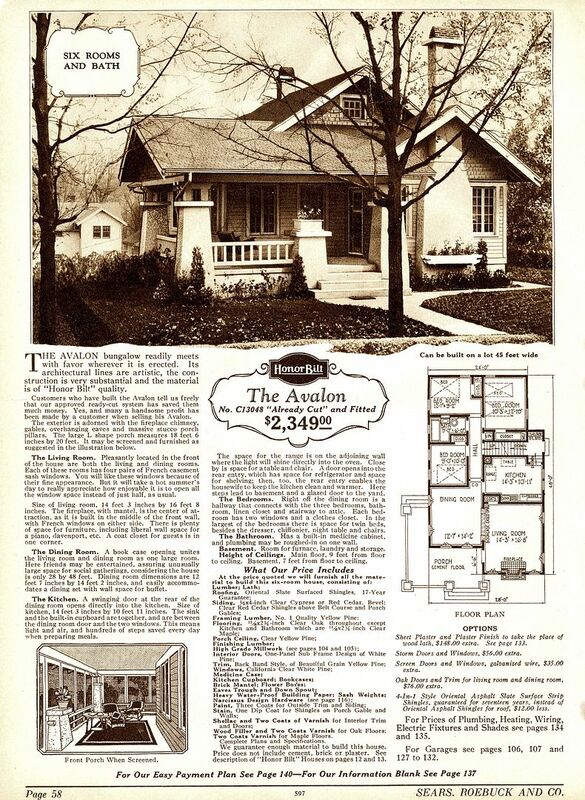 The Avalon - from the 1928 catalog. 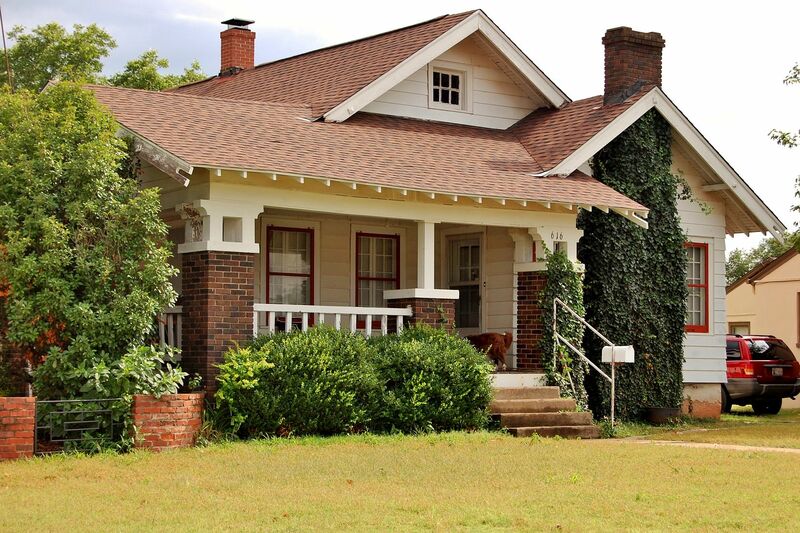 A picture-perfect Avalon in Perry, Oklahoma. My oh my, what a pretty house. And I love the colors! Photo is copyright 2012 Kendale Benton and may not be used or reproduced without written permission. Another view of the world's most perfect Avalon. Photo is copyright 2012 Kendale Benton and may not be used or reproduced without written permission. This Avalon is in Dekalb, Illinois. Photo was taken in 2002. Another perfect Avalon. This one is in Raleigh, NC. Dale Wolicki found this Avalon in Park Ridge, Illinois. Photo is copyright 2012 Dale Wolicki and may not be used or reproduced without written permission. Even Virginia has an Avalon. I found this one in Richmond, and it's also in beautifully original condition. 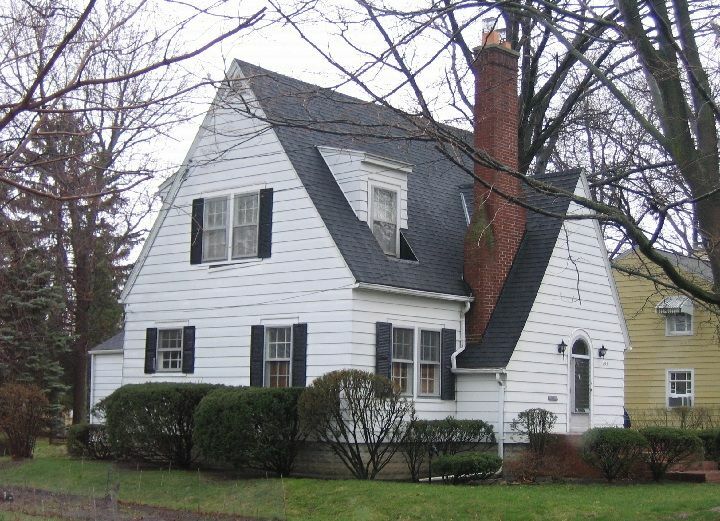 Note the three vents on the side gable and the detail on the chimney. 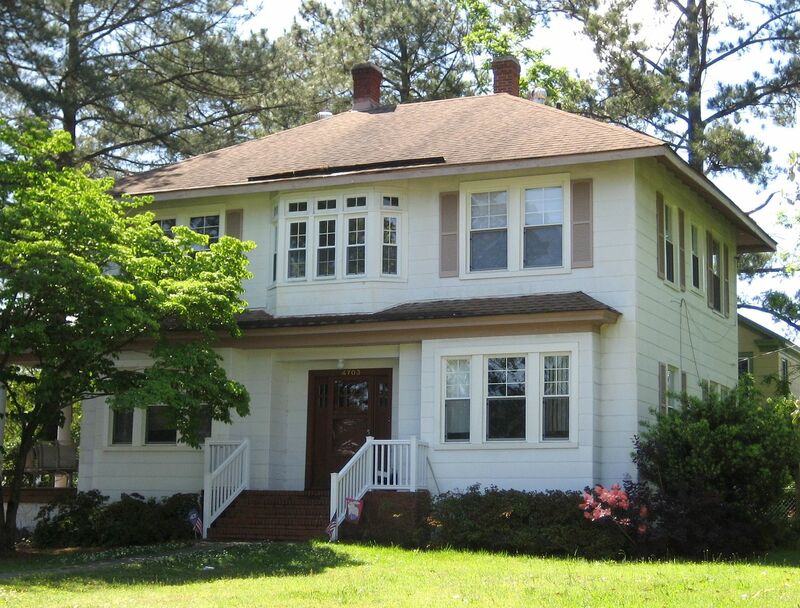 To learn more about Sears Homes in Richmond, Virginia click here. 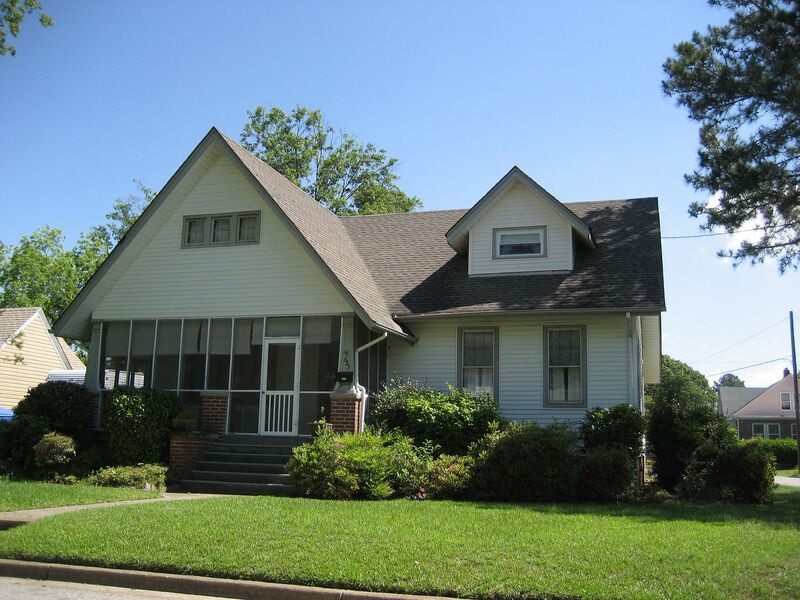 To read more about Sears Homes in Oklahoma, click here. Last month, I spent several days traveling in South Carolina. 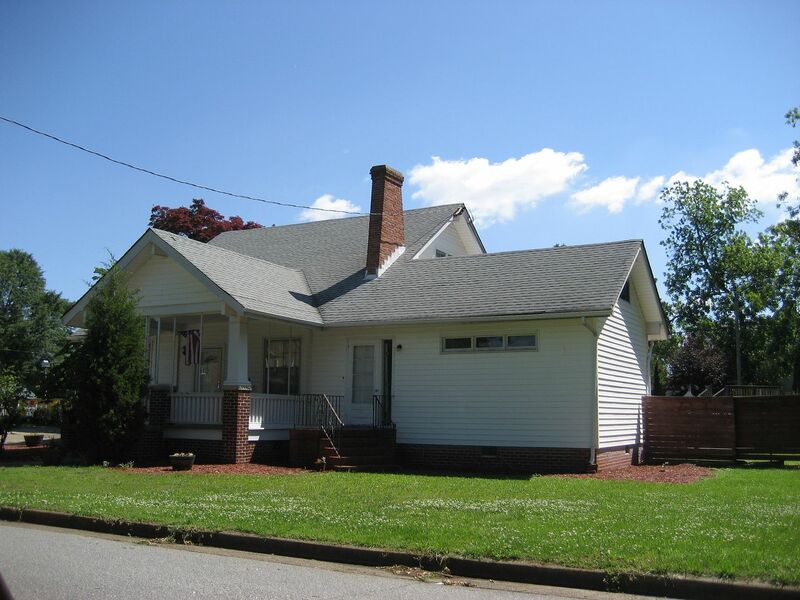 I visited many cities in the northern part of South Carolina but found very few Sears Homes. The highlight of the trip was Anderson, where I found several kit homes from Sterling Homes (a competitor to Sears). Click here to see photos of those houses. I did, however, find more than 20 chiggers. Or should I say, they found me. I was in Pumpkintown, SC merrily traipsing through a happy, happy meadow when I picked up Satan’s microscopic hitchhikers. During an earlier trip to Blacksburg, South Carolina (February 2011), I’d visited the twin of the Sears Magnolia. 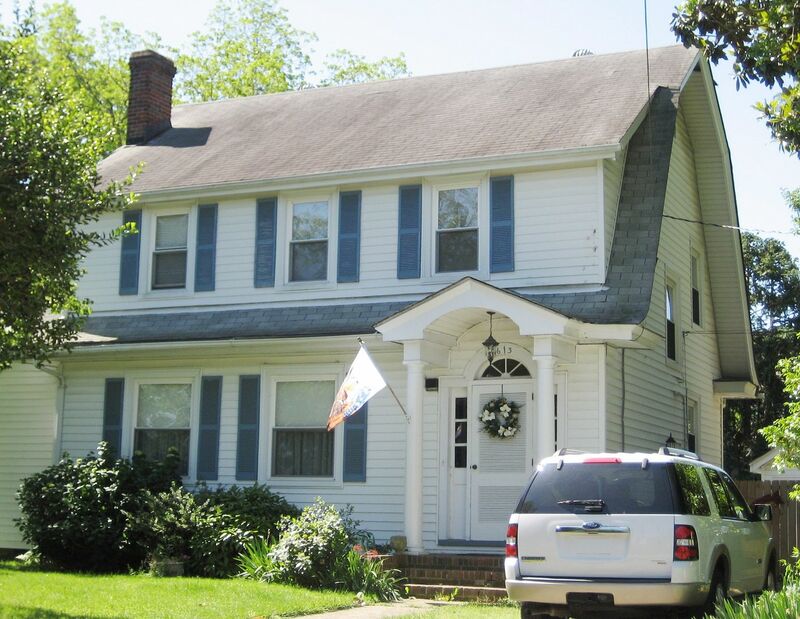 The house in Blacksburg turned out to be a fake Sears Magnolia. And yet, it was so close to the real thing. After spending three days at this fine house, I decided it could not be a Magnolia. 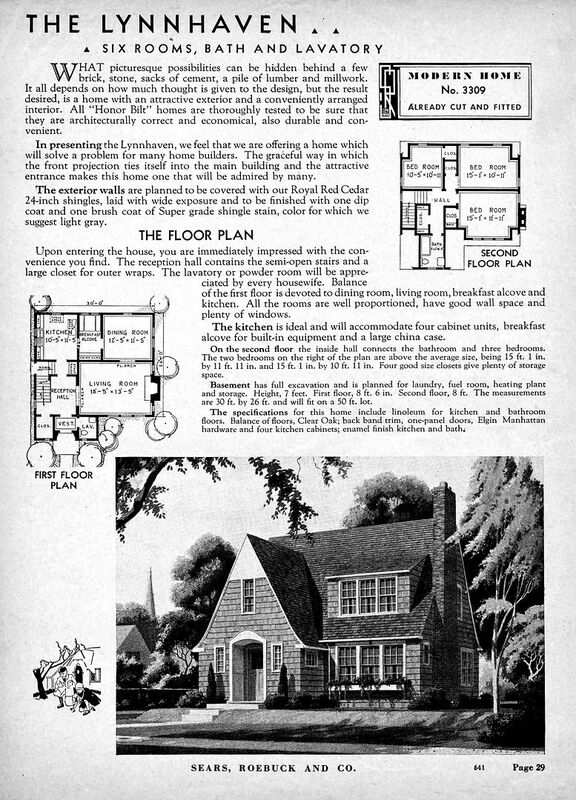 In retrospect, I believe it may have been an early pattern book house, and that the fine folks at Sears discovered this pattern book design and incorporated it into their “Book of Modern Homes,” calling it, The Magnolia. 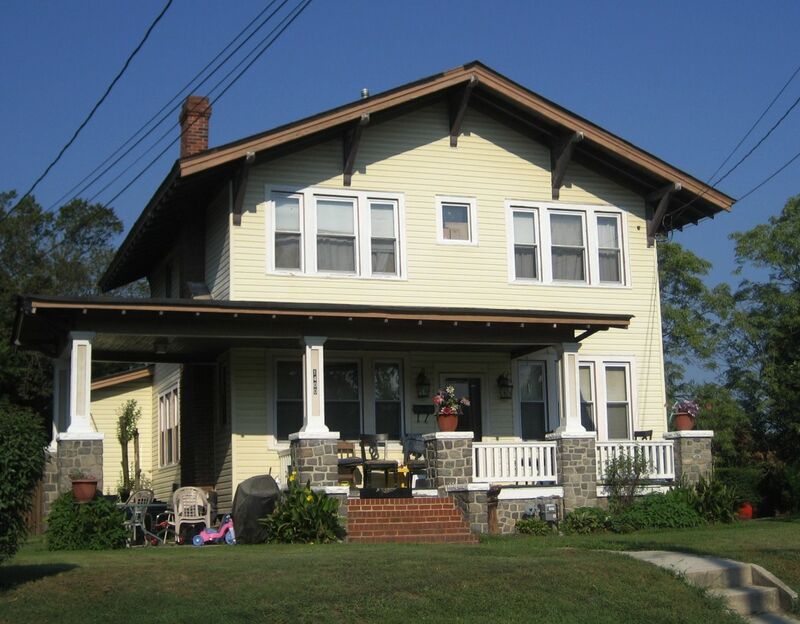 The house in Blacksburg was built about 1910 (according to tax records), which also fits with my pattern book theory. This “SCFM” (”South Carolina Faux Maggy”) is four feet wider and four feet longer than the Sears Magnolia, which is interesting (and also fits with the above theory). When Sears “borrowed” patters from other sources, they’d change the dimensions a bit, and in the case of the SCFM, it was a tiny bit too big for Sears purposes, so shrinking the footprint made a lot of sense. One more interesting detail: The underside of the front porch (eaves) shows that there are ten brackets on the Sears Magnolia. The SCFM has eight brackets. The Magnolia’s dormer has four of these eave brackets. The SCFM has three. These are the kind of details that matter. I seriously doubt the SCFM is the only one of its kind. Does your town have a fake Magnolia? To read my favorite blog on the Sears Magnolia, click here. It’s an old carpenter telling about HOW he built a Magnolia in the 1920s. To read about the sweet ride that carried me to old South Carolina, click here. 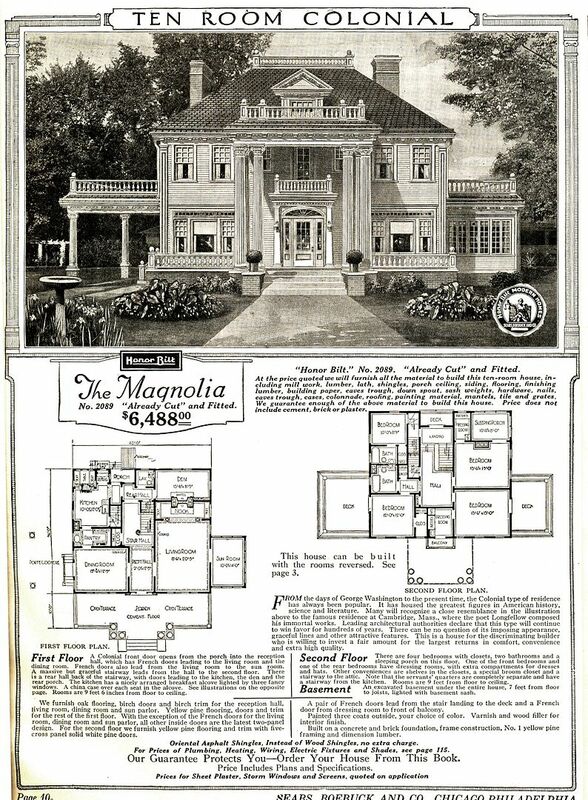 The Sears Magnolia, as seen in the 1921 catalog. And here's the SCFM in Blacksburg. It's NOT a Sears House, but it sure is close. Even has those distinctive marginal lites. And the porch is a good match, too. One of the first details that caught my eye were these columns. They're concrete. 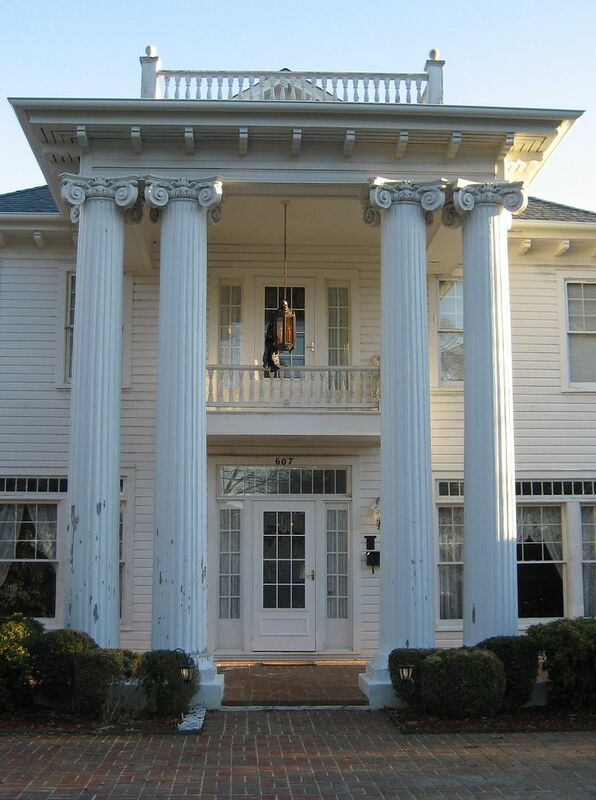 The Sears Magnolia had hollow wooden columns (poplar). 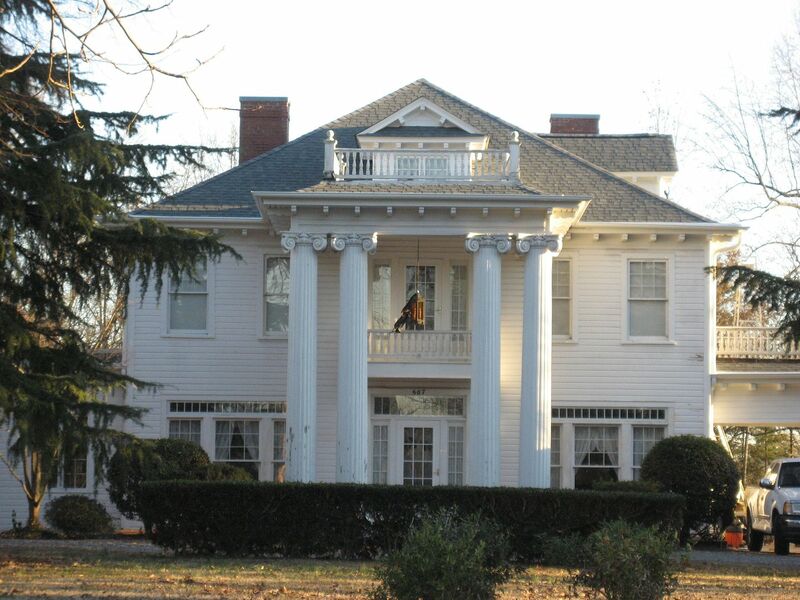 No kit house is going to come with concrete two-story Corinthian columns. The weight would be enormous. 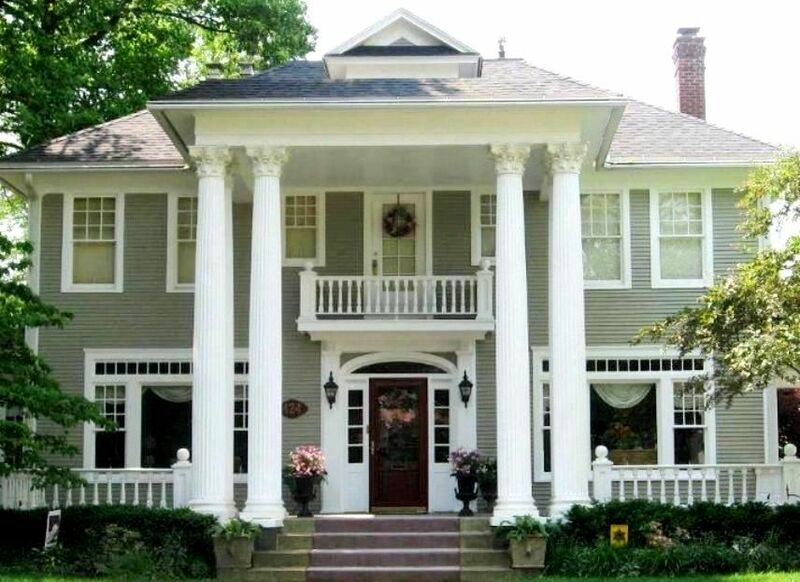 When I saw these columns I knew - this was not a kit home from Sears. Minus the concrete columns, it's still such a good match. 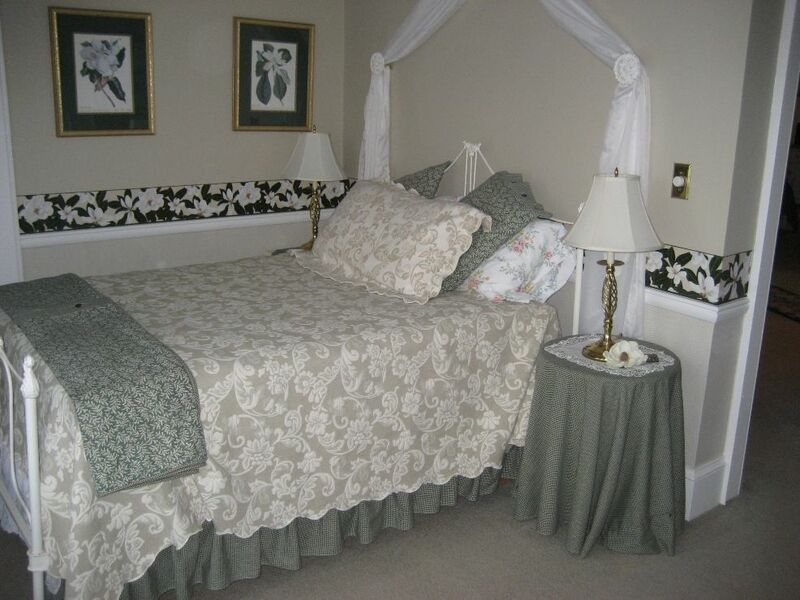 Inside the house, it has a "Magnolia Room"! How apropos! The city's records show that this house was built in 1910, and oftimes, those city records are not always right, but in this case, I suspect they're close. 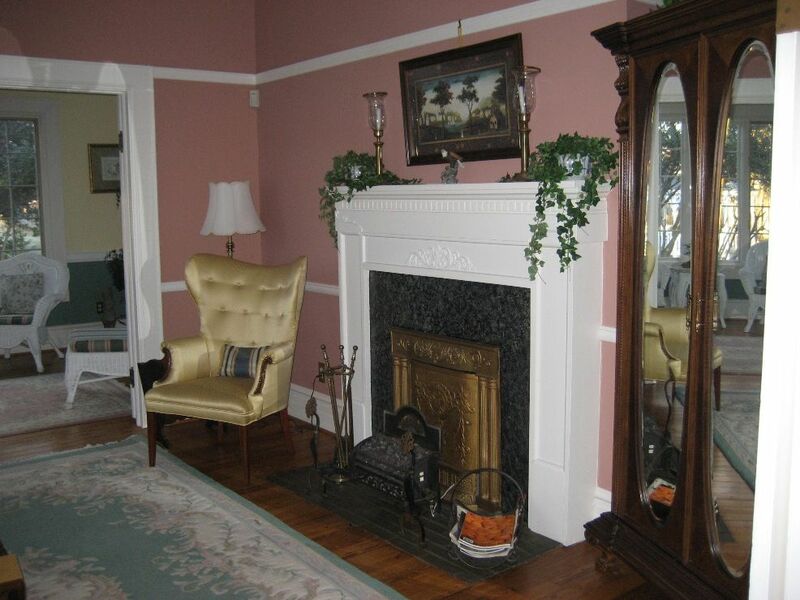 The SCFM had a fireplace in every room and they were coal-burning fireplaces, which was typical for homes built in the first years of the 1900s. The Magnolia had two fireplaces, both wood-burning. 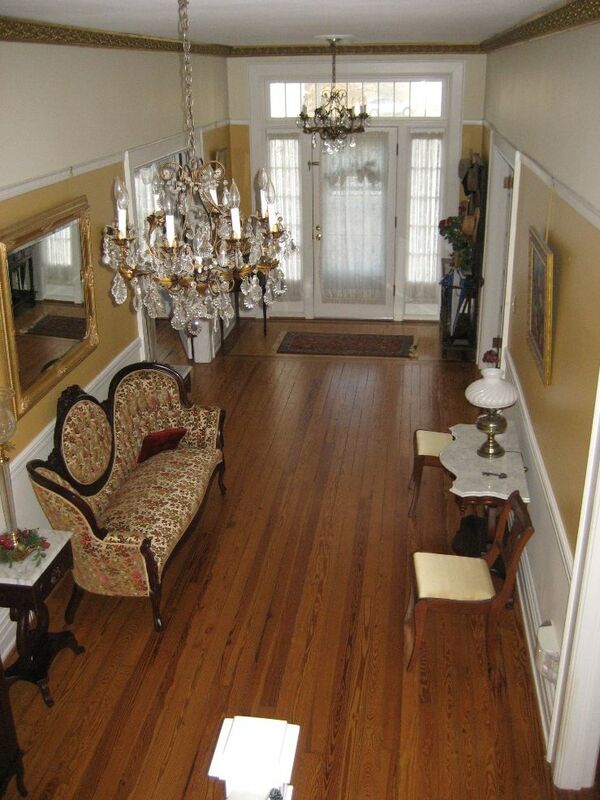 This beautifully decorated house has a massive entry hall, but that's one of the problems. 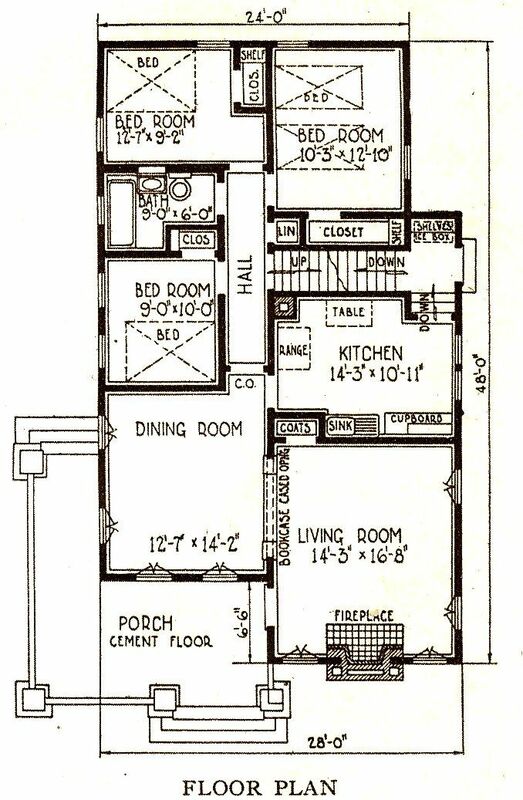 The floorplan for this SCFM is NOT a good match to the Magnolia's floorplan. Plus, the Sears Magnolia had nine-foot ceilings. The ceilings in this house were 10' or more. The staircase in the real Magnolia is in a different spot. It's much closer to the front of the house, whereas the SCFM's staircase is much further back, and its hallway goes straight back to a rear entry door (unlike the floorplan above). In the end, I had to boldly declare that this was NOT a Sears Magnolia which made me very sad. However, it did tell me that this was probably a planbook house at some point. Now we just need to figure out WHICH plan book! Also in Blacksburg, SC I found my favorite Alhambra of all time. It's LAVENDER! Such a beauty - but it's not from Sears. This is the real deal in Canton, Ohio. Photo is copyright 2012 Janet Hess LaMonica and can not be used or reproduced without written permission. So there. To read more about the Sears Magnolia, click here. 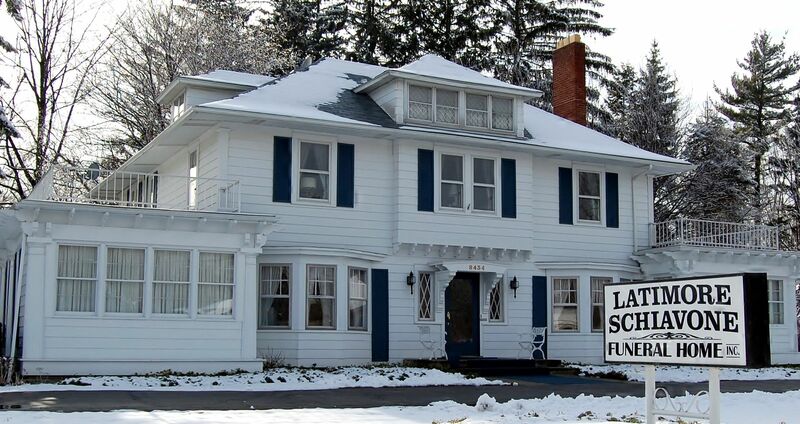 Thanks wholly to Rachel Shoemaker, we’ve discovered another fancy kit home, and this one is in Angola, NY. In fact, thanks to Rachel, the old legends surrounding this old “mail-order” house will now be righted - we hope! 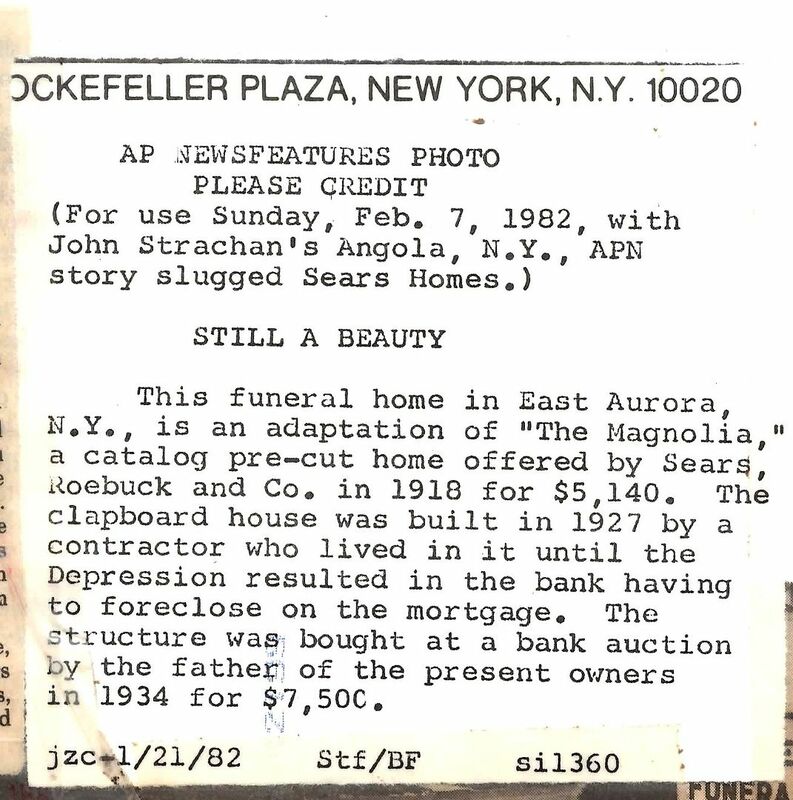 If folks had been paying attention to the details, they would have known that the Sears Magnolia was only offered from 1918 to 1922. The house in Angola, was built in 1927. In fact, the big fancy house in Angola is a Sterling Vernon. 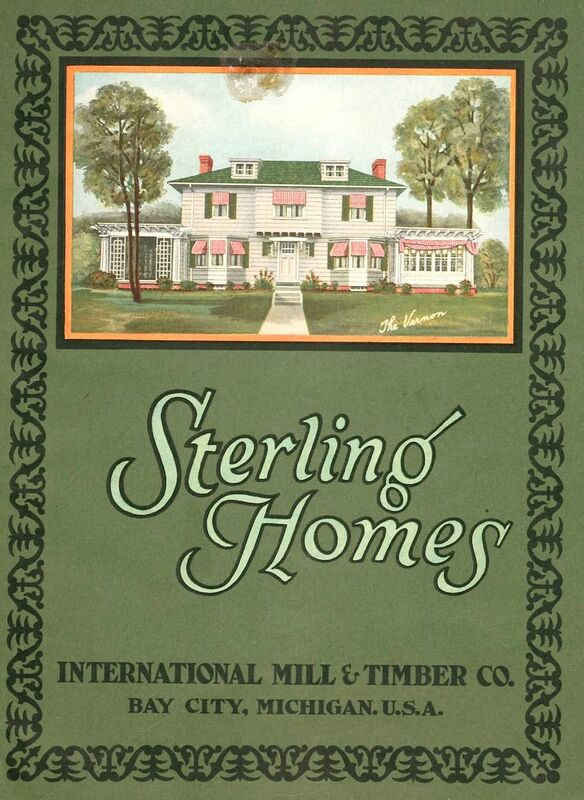 Sterling (like Sears), sold kit homes through a mail-order catalog. 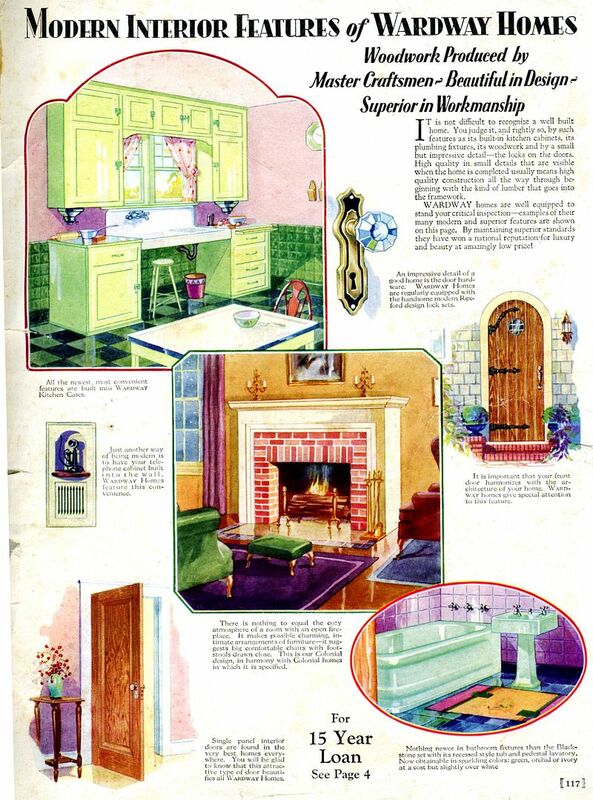 Sears was the largest and most well-known of the mail-order kit home companies, but Sterling was also a pretty significant player. 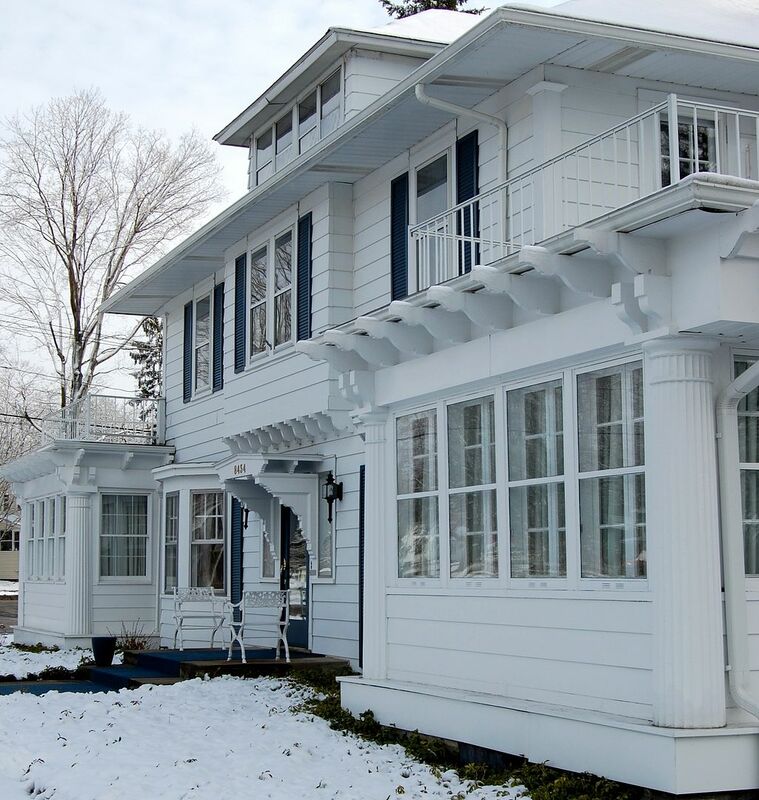 According to Architectural Historian Dale Wolicki, Sterling sold about 50,000 kit homes in the early 1900s. Thanks to Rachel for finding this house and then (somehow) finding photos of the house - both old and new - which are shown below. Sears Magnolia? I don't think so. Looks a lot like a Sterling Vernon to me. Photo credit is not known. If anyone reading this blog can identify the photographer, please contact me as soon as possible. This photo is apparently from 1982 (according to info found on the back). 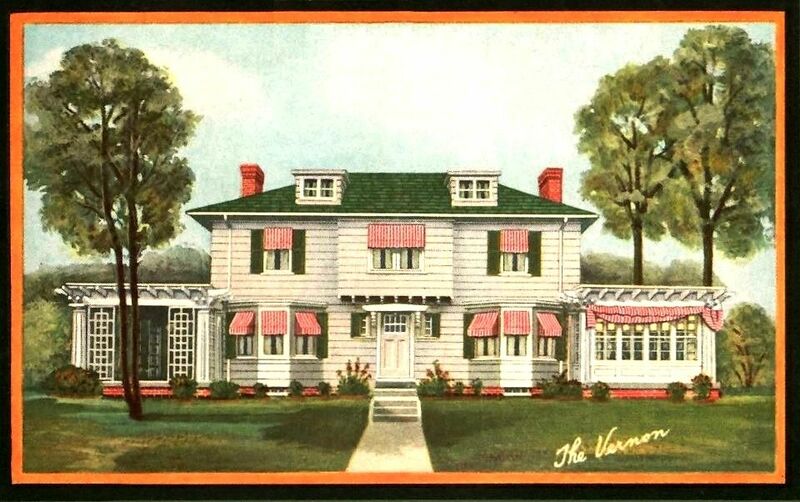 The Sterling Vernon was featured on the cover of their 1928 catalog. 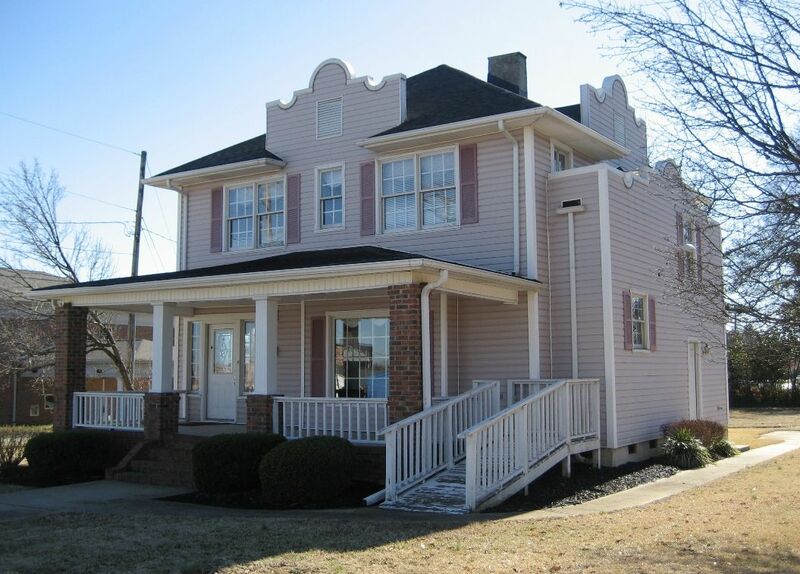 You'll notice, the house in Angola looks a lot like THIS house! That's because it came from a kit home company in Bay City, MI known as Sterling Homes. 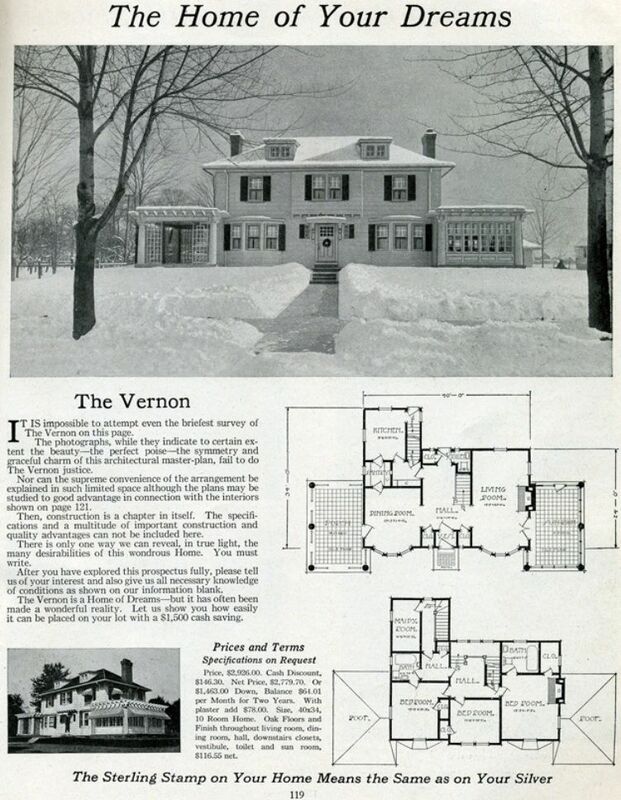 Catalog page featuring the Sterling Vernon. 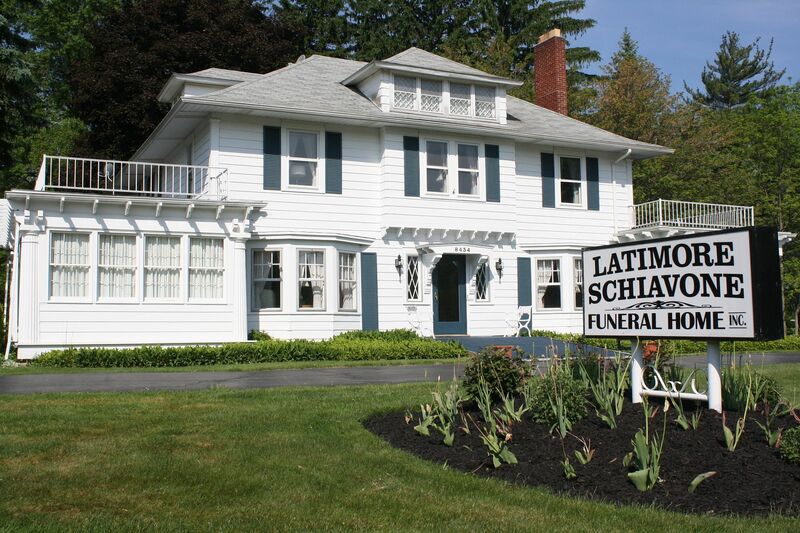 Now in use as a Funeral Home, this massive old manse in Angola, NY was alleged to be a Sears Magnolia for many years. 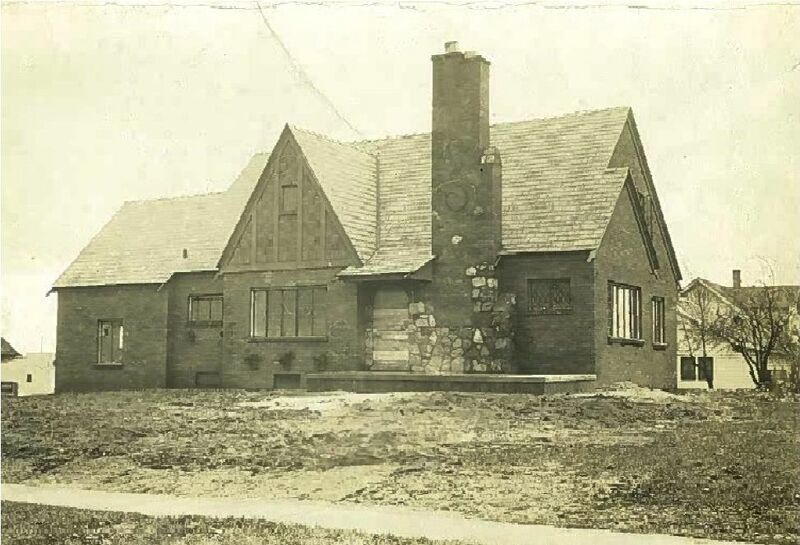 It was built in 1927, and it's not a Sears House, but a house sold by Sterling, based in Bay City, Michigan. This "Sterling Vernon" is 100% perfect - right down to the Photo is copyright 2012 Tiger Schmittendorf and may not be used or reproduced without written permission. Another view of the Sterling Vernon in Angola, NY. Photo is copyright 2012 Tiger Schmittendorf and may not be used or reproduced without written permission. Photo is copyright 2012 Tiger Schmittendorf and may not be used or reproduced without written permission. Look at those porches! How pretty!! Photo is copyright 2012 Tiger Schmittendorf and may not be used or reproduced without written permission. The Sears Magnolia was offered from 1918 - 1922. Now THIS is a Sears Magnolia! This is one of seven known Magnolias in the country. This house is in Canton, Ohio. 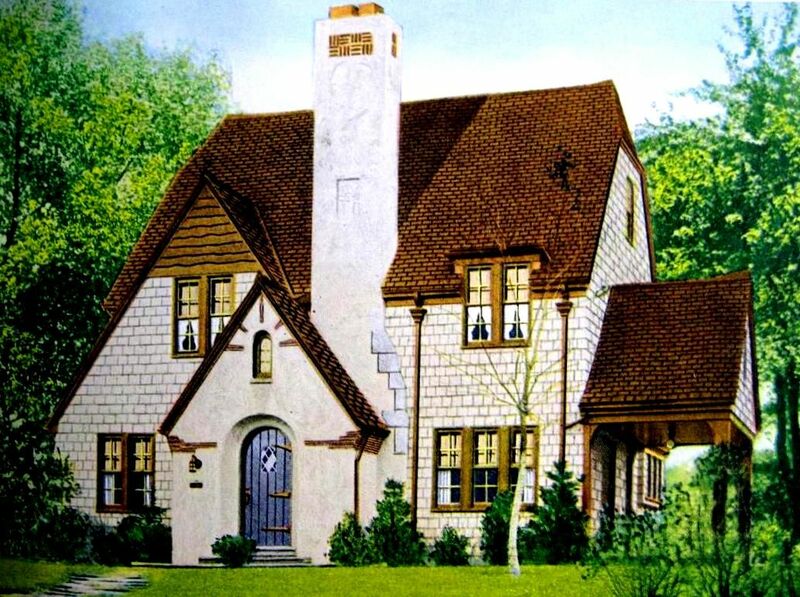 You'll note that this house looks a LOT like the catalog page above. Photo is copyright 2012 Janet Hess LaMonica and may not be used or reproduced without written permission. To see a Sterling Vernon found in Anderson, SC click here. To read my favorite “Magnolia” story, click here. 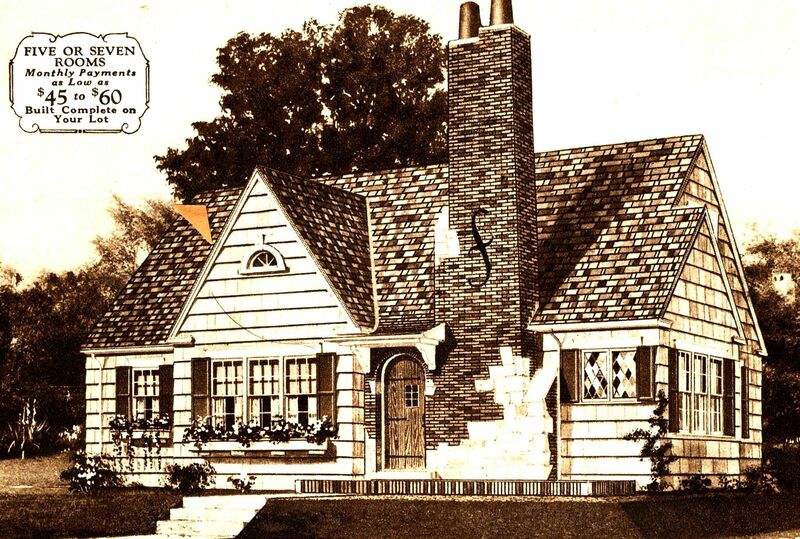 Some models of Sears Homes were wildly popular. Some were not. The Homewood falls into the second category. 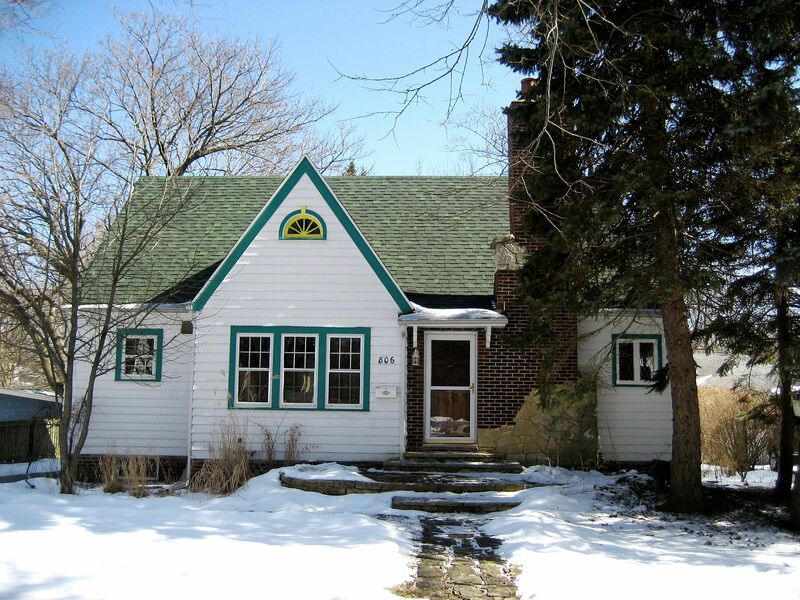 And yet, it’s a puzzle as to why this attractive two-story bungalow was not a big seller for Sears. With 784 square feet on each floor (about 1,600 square feet total), it was spacious with good-sized rooms and a thoughtful floorplan. And the price ($2,535 in 1928) was about average for the time period. This house was only offered for a handful of years. Perhaps that’s why we don’t see more models of The Sears Homewood. 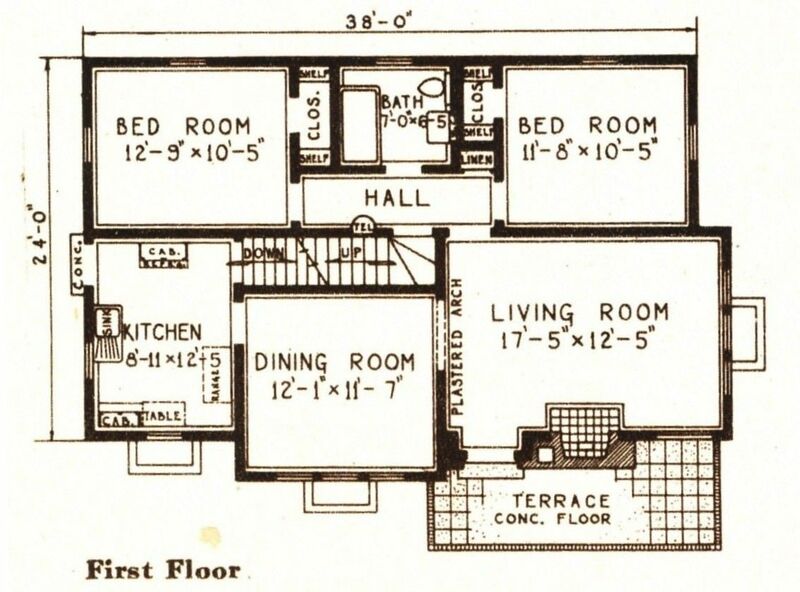 Nice floorplan, and about 784 square feet per floor. All of the bedrooms have a nice-sized closet. What a bonus! 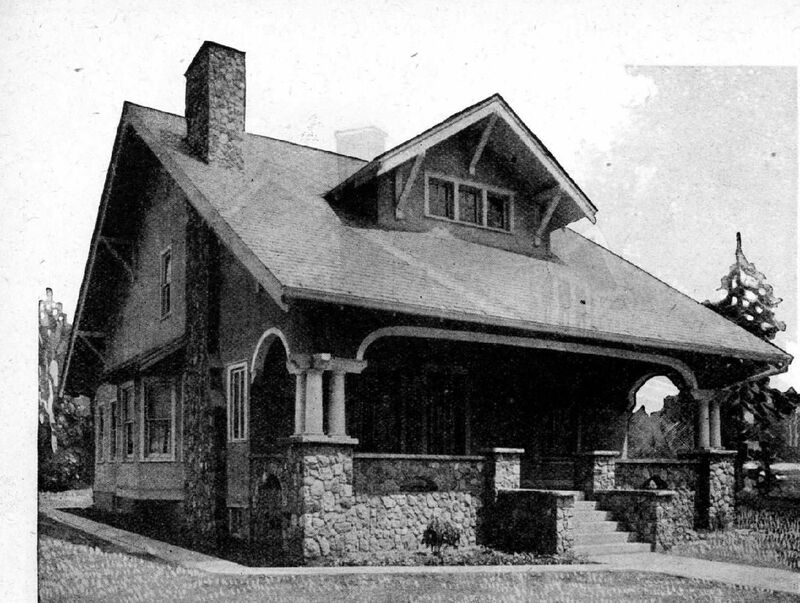 The Homewood was a fine-looking bungalow! Here's one in Elmhurst, Illinois. Thanks to Rebecca Hunter for finding this house, and then driving me over there to Elmhurst so I could get a good photo! This model did not have a fireplace. Not all that unusual in Sears Homes. Fireplaces were optional. 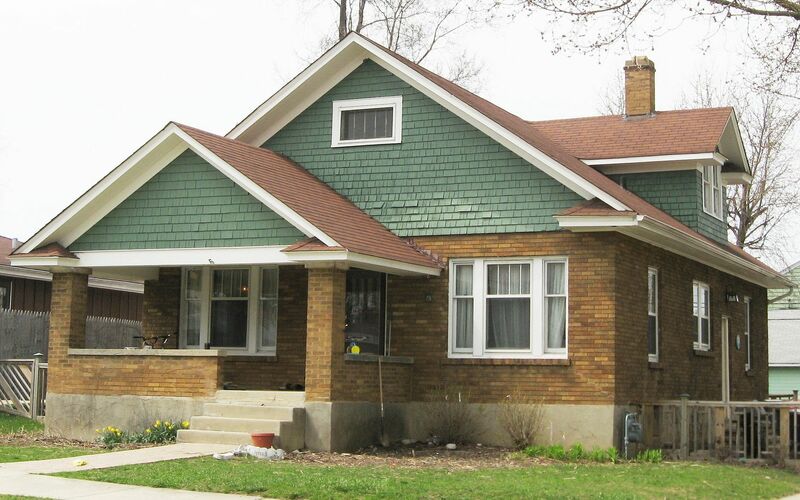 To read about the other Sears Homes in Northern Illinois, click here. GVT #605: Exceptionally Well Planned! From 1995-2006, I lived in Southwestern Illinois, specifically Elsah, Alton and later, Godfrey. 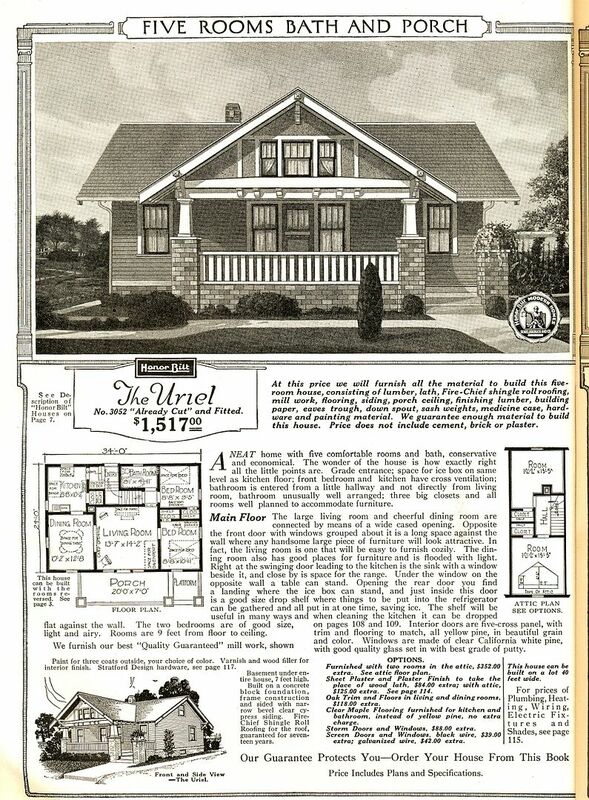 While I was living in this area, I became enchanted with the topic of Sears Homes, and I spent countless hours of my life driving around Southwestern Illinois, staring at the pre-1940 architecture, hoping to find (and identify) a few kit homes. One of my favorite finds in Alton was this Gordon Van Tine Model #605. 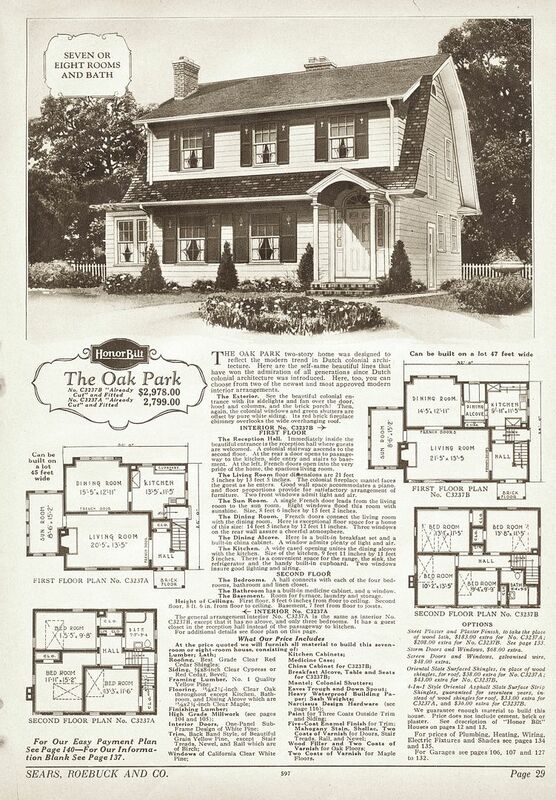 Gordon Van Tine was another company that (like Sears) sold entire kit homes through a mail-order catalog. Number 605 was one of their more popular models. There are three of these houses in Alton. If someone in Alton could get me photos of the other two, I’d be very grateful! Gordon Van Tine #605 as seen in the 1922 catalog. The testimonial at the bottom of the page gives an address for Model #605 in California! My kingdom for a picture of THIS house! 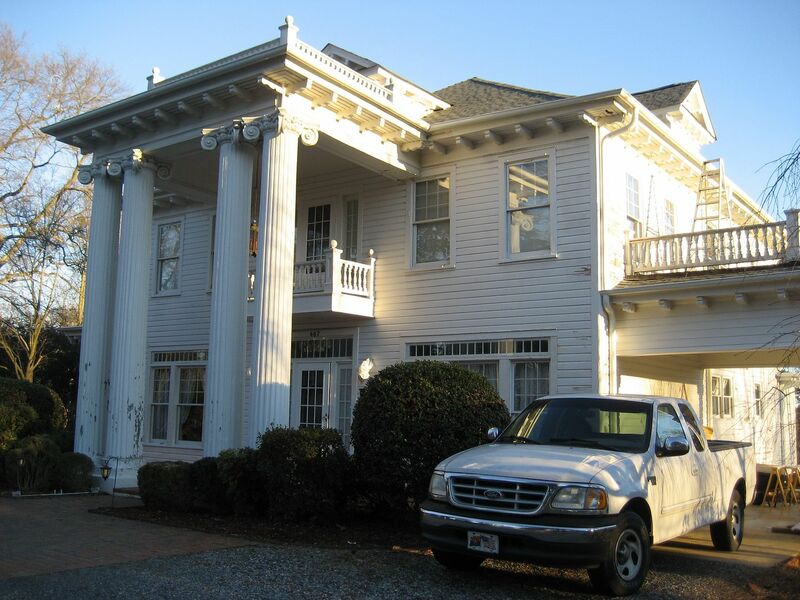 When I first started doing research in Alton, several people told me that *this* was a Sears kit house. 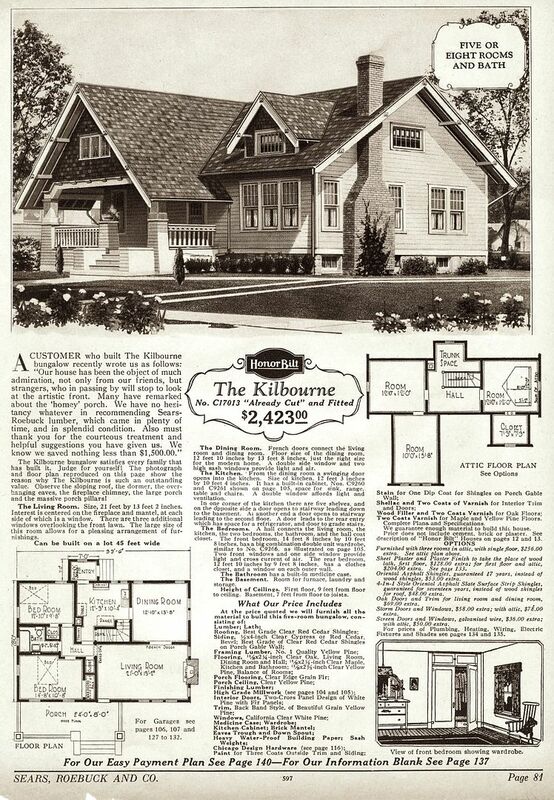 As I started to learn about these other kit home companies, I finally realized that it *was* a kit house, but it was a kit home from Gordon Van Tine. In my experience, this is a common mistake. About 80% of the people who THINK they have a "Sears Home" are wrong. The majority DO have a kit home, but it's from another company. 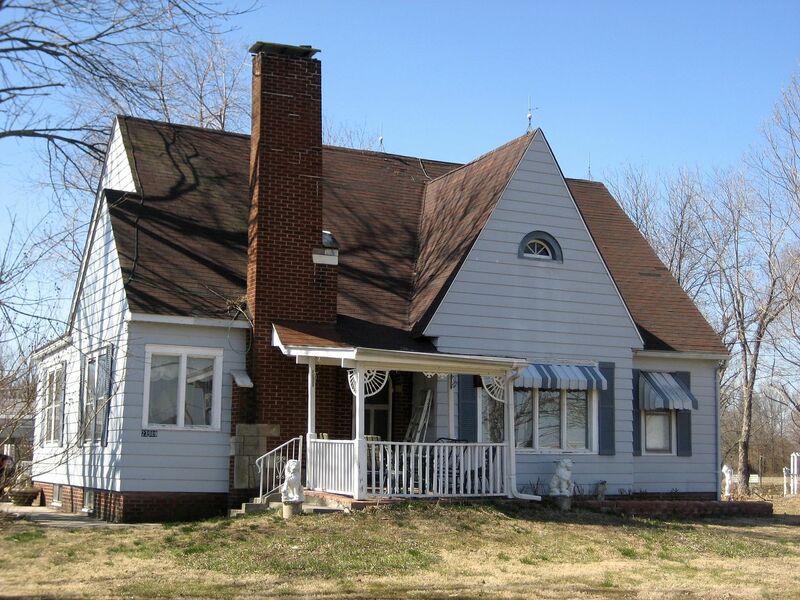 Need to buy a house in Southwestern Illinois? Click here. In 1957, they moved to Waterview. 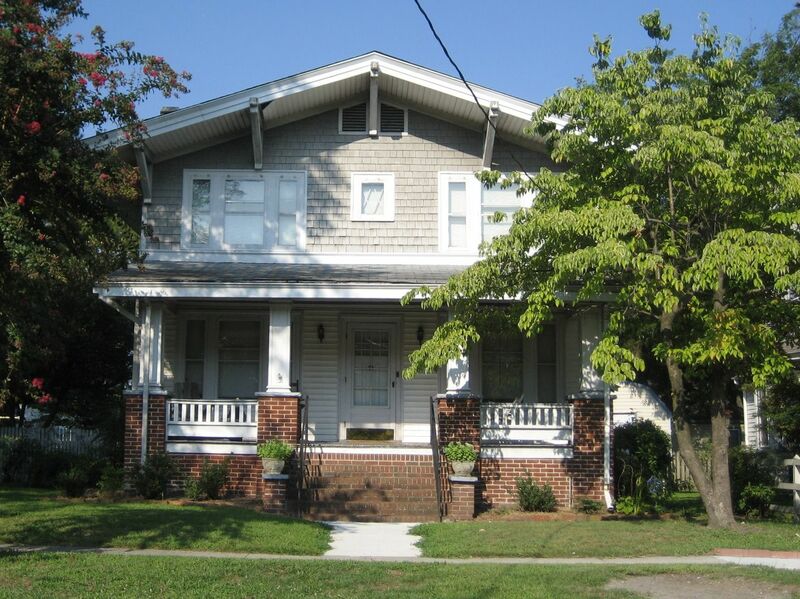 Using my mother’s Veteran’s Benefits (she was in the WAVES), Mother and Father obtained a VA loan and purchased 515 Nansemond Street. They paid $17,500 for the house. In 1971, they paid off the mortgage. In 1978, I moved out to marry Tom Thornton, and we bought a house in Portsmouth. My mother remained in the house until 1985, when she sold it for $65,000, and moved into a duplex on Orange Street (in Waterview). From 1985-2006, I lived in St. Louis, and when I returned to Hampton Roads, I married a fellow who works for the city of Norfolk, but I’m still a Portsmouth girl - through and through. When Sears Homes became my life, I had a lot of fun finding these “hidden treasures” in Portsmouth. Scroll on down to see a few of the many pretties in P-town! 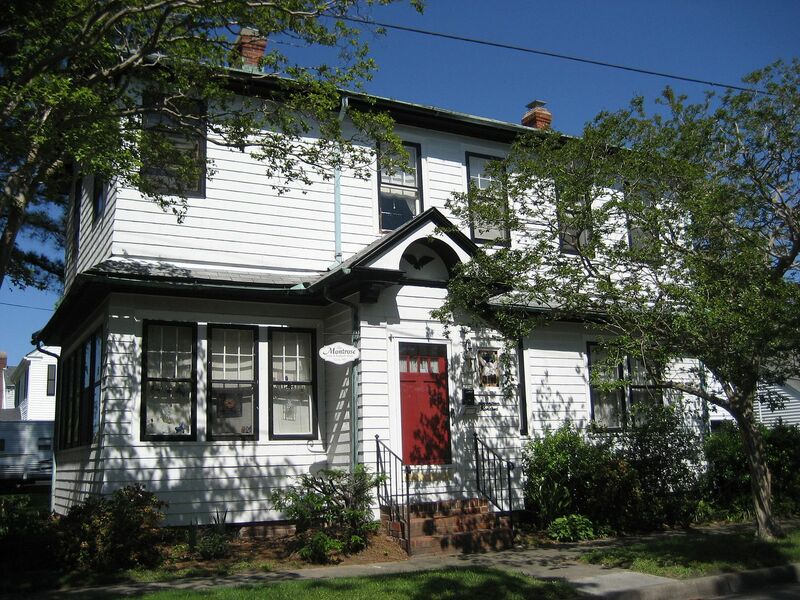 Here's a picture of our family homestead in Waterview (on Nansemond Street). The photo was taken in 1957, shortly after our family purchased the house. 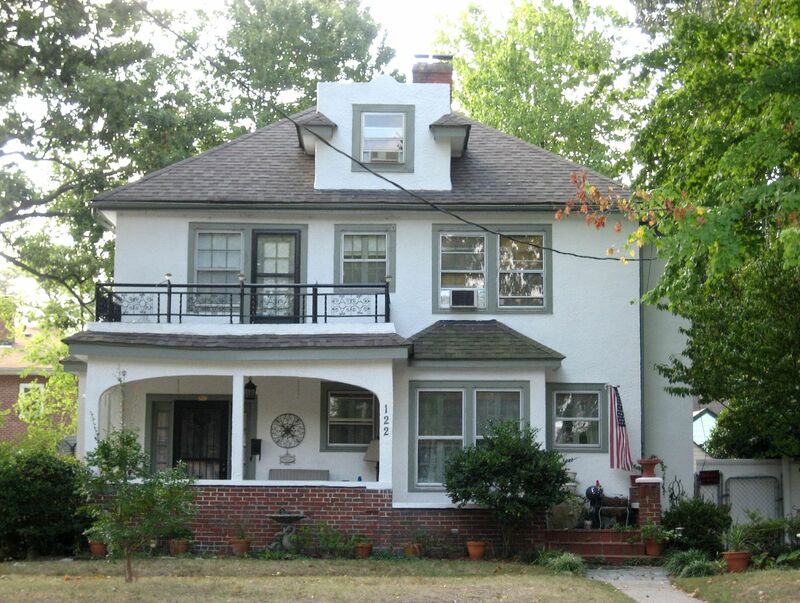 This is *not* a Sears Home, but it's the house where I was born and raised. 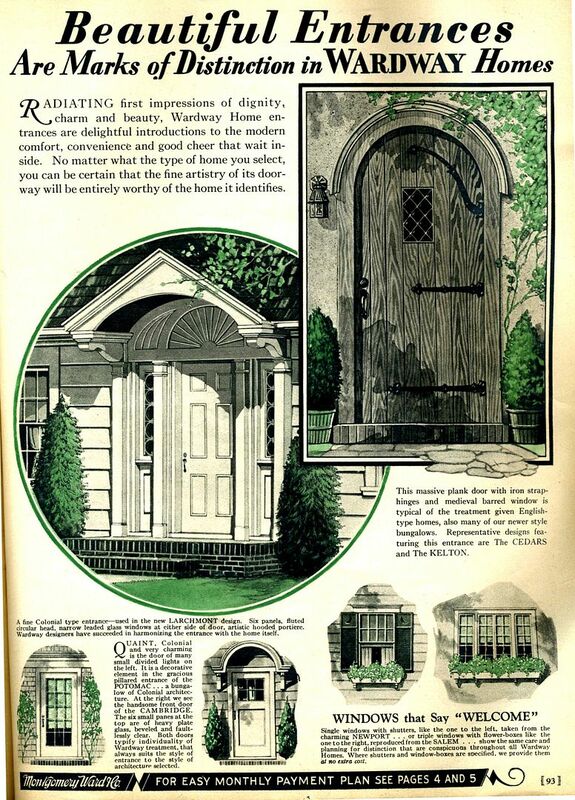 Waterview is home to several kit homes, such as this Sears Kilbourne (1928 catalog). And what a fine-looking Kilbourne it is! 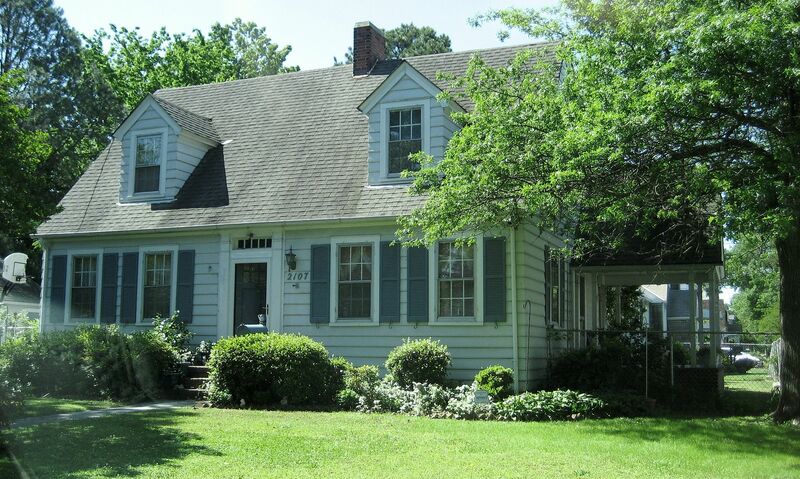 This house is in Waterview, about 1/2 mile from my family home at 515 Nansemond Street. Even closer to my house in Waterview is this kit home, The Marlboro. 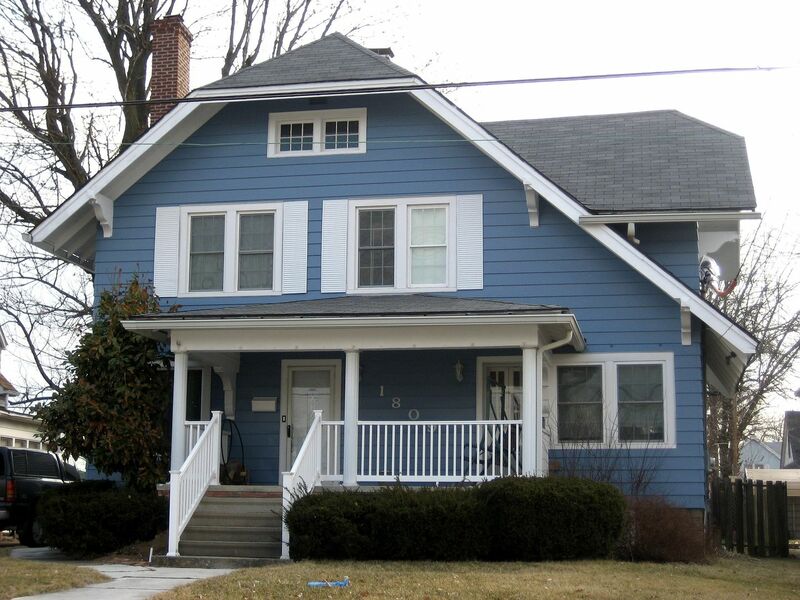 This house is not a Sears House, but it was sold by another mail-order company known as Lewis Manufacturing. 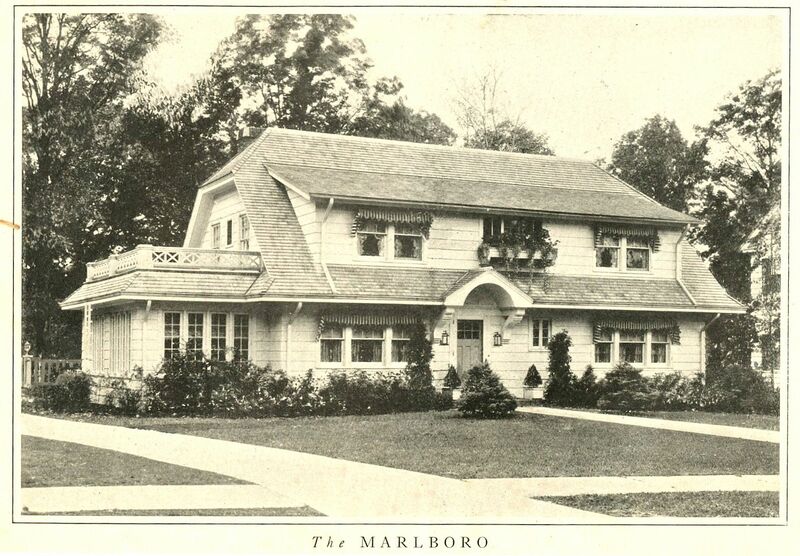 The Marlboro was their biggest model, and we have one on High Street in Waterview! This is an old picture (from about 2004). I was unable to get a more modern photo because of the beautiful landscaping that now surrounds the house. Yes, it's definitely a Marlboro, and it's the house where Jim and Tammy Faye Bakker lived in the 1960s when they worked at WYAH. 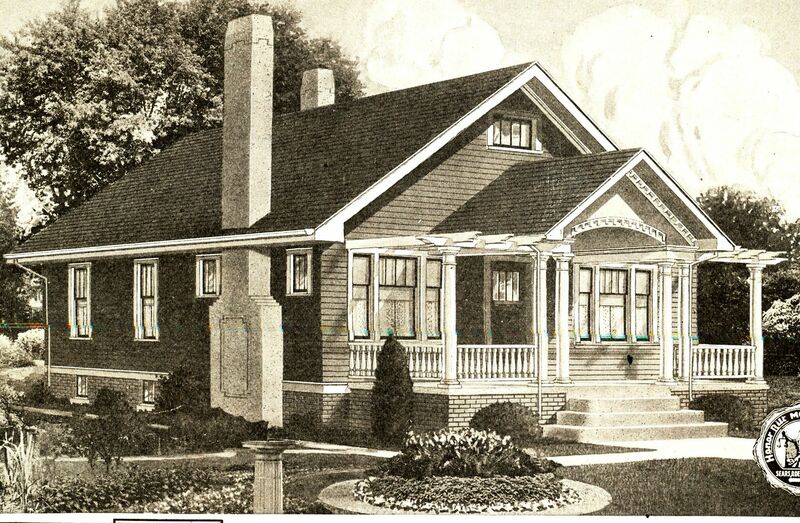 And another Waterview kit home - the Sears Lynnhaven (1938 catalog). 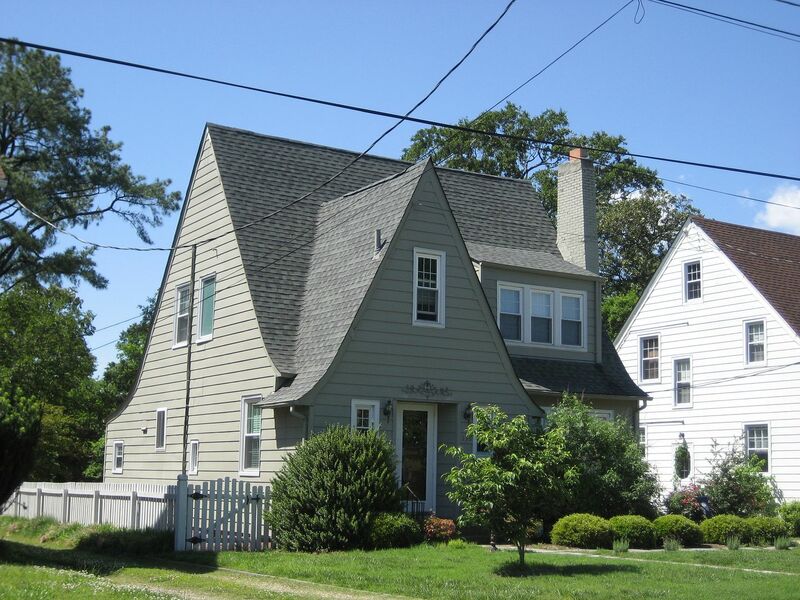 There are TWO Lynnhavens on Grayson Street in Waterview, and both are in beautiful condition. The other Lynnhaven is brick and pretty well covered by trees and bushes. Also in Waterview is one of my favorite pattern book houses in all the world. 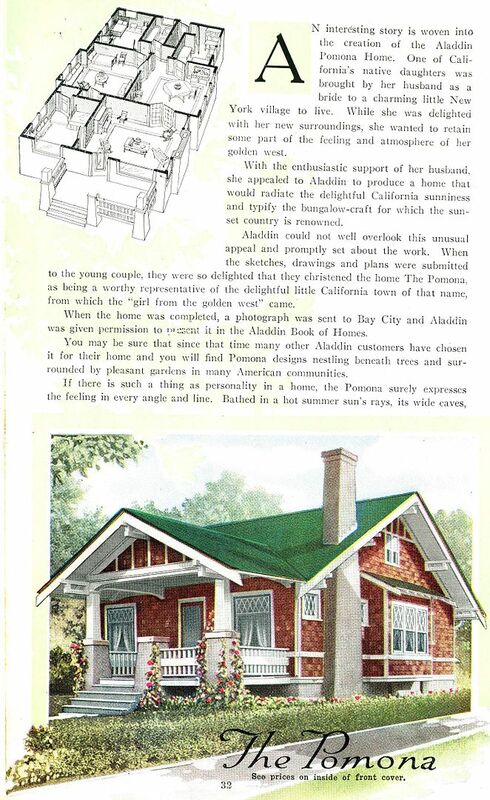 "Pattern Book" houses were a little different from "kit homes." 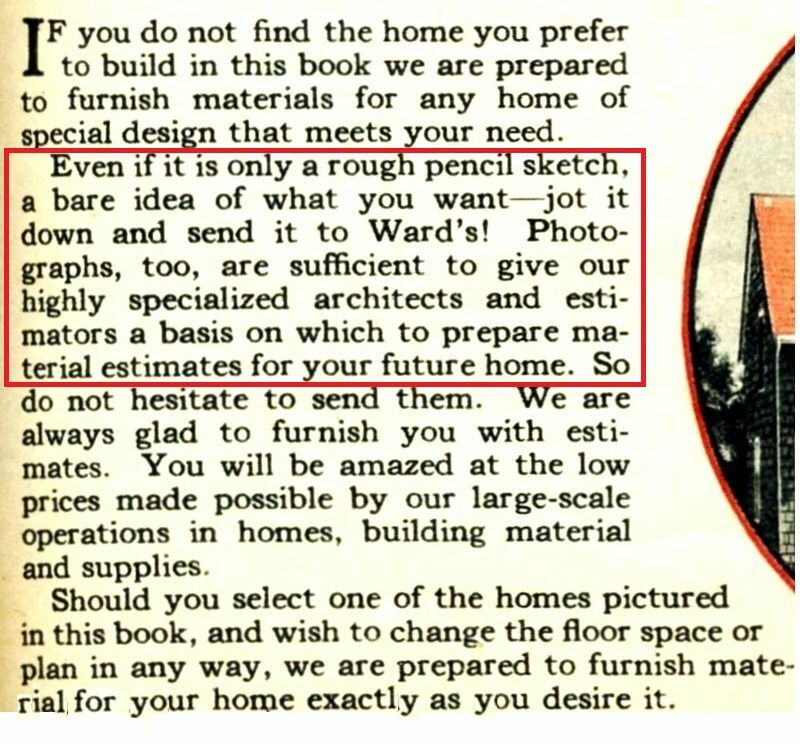 With a pattern book, you'd select the house of your dreams and send in your money and you'd receive the blueprints and a list of building materials needed to erect the house. You were on your own to buy the building materials. With kit homes, the whole kit and caboodle came right to your train station. This pattern book house is a beauty, and the extant home in Waterview is a perfect match. And it's even painted the same colors! All the details are perfect! And just across the footbridge (on Riverside Drive), you'll find this Sears Glenn Falls. 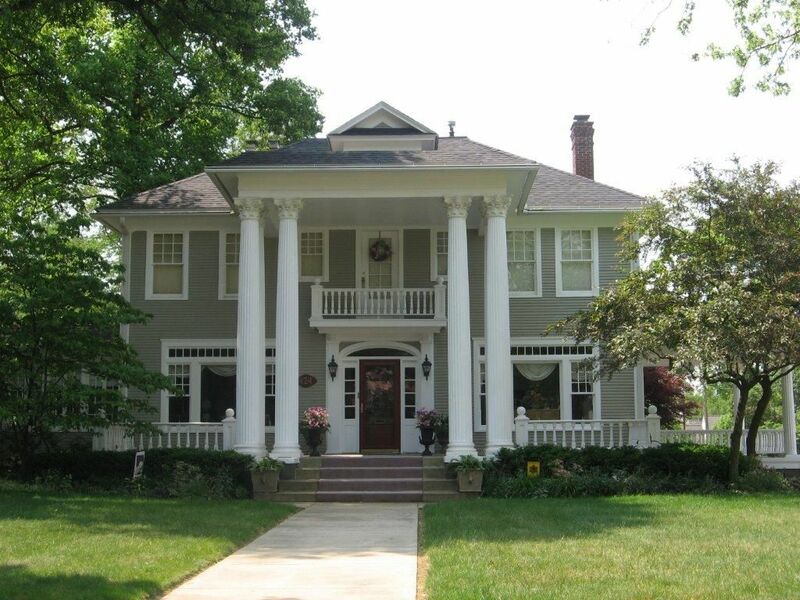 Ever since I was a little girl riding my bike around the neighborhood, I loved and admired this house. And now that I'm all growed up, I realize it's a Sears House! 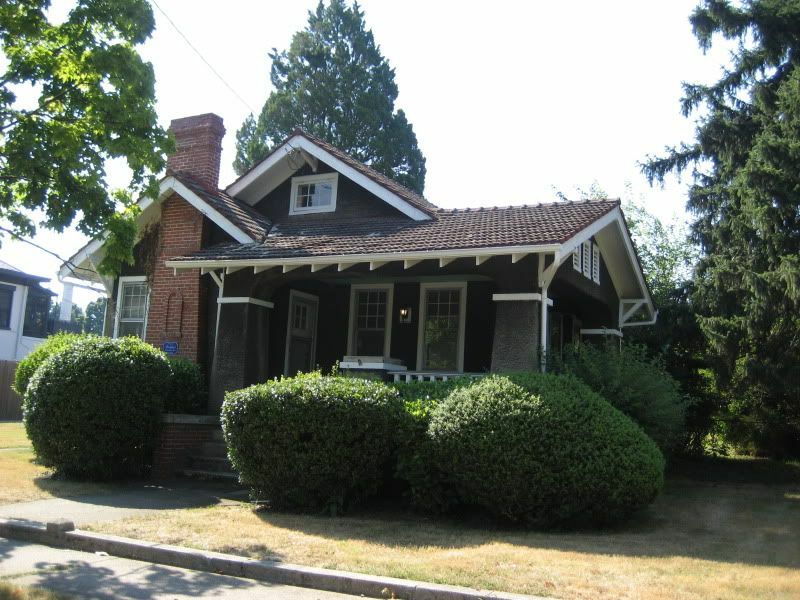 Westhaven has several kit homes, too, such as this grand old "Roberts" (offered by Gordon Van Tine). 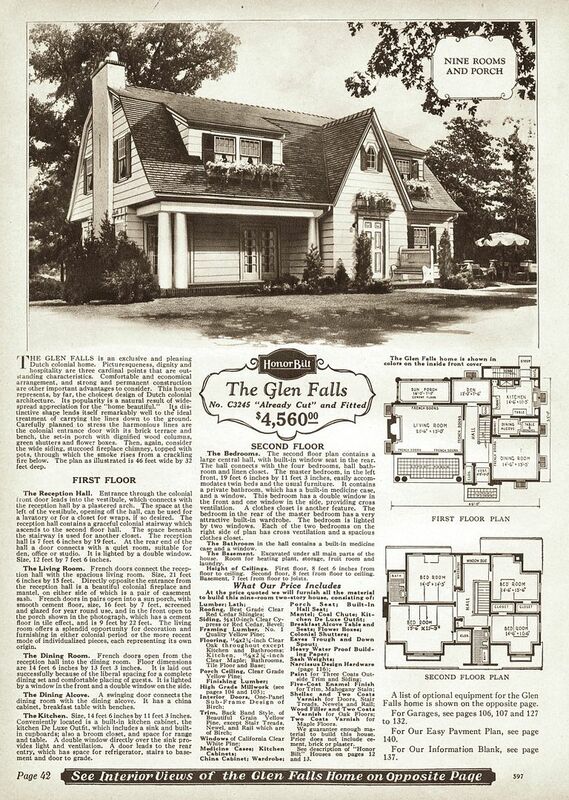 Gordon Van Tine was also a large national company that - like Sears - sold kit homes through a mail-order catalog. This "Roberts" is in beautiful shape, and sits on one of those quiet, tree-canopied roads that are so prevalent in P-town. Anyone know the owners? I'd love to see the interior. Another favorite in Westhaven is this Sears Westly (shown here in the 1916 catalog). It's an older photo (about 2003), but what a beautiful match! Notice that the house has a slate roof? Unusual, but not unheard of. Buckingham Slate weighs about 1,400 pounds per square (10' by 10' section), so the roof has to be built up to accomodate the weight. 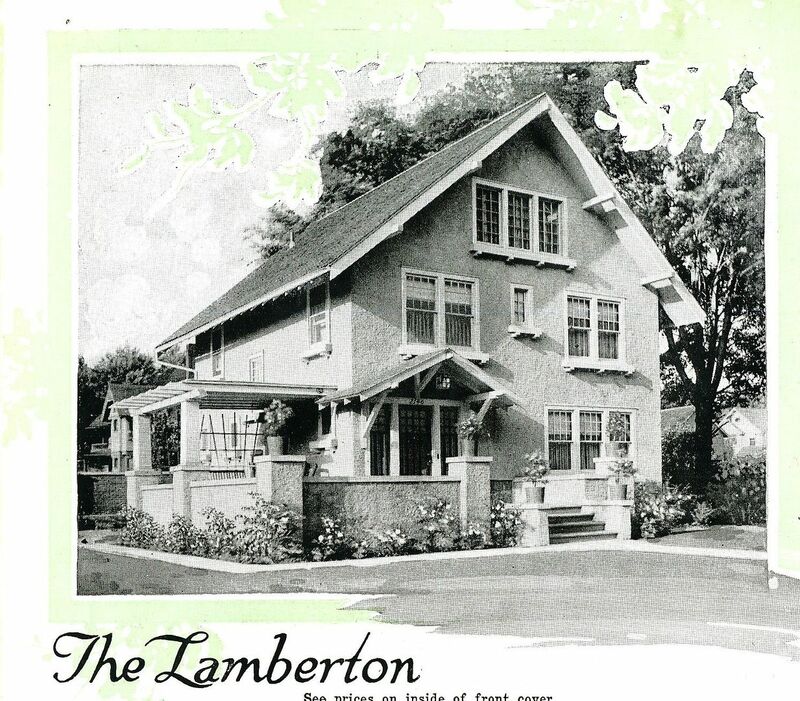 This Aladdin Lamberton is in Westhaven, not far from the Sears Westly (shown above). 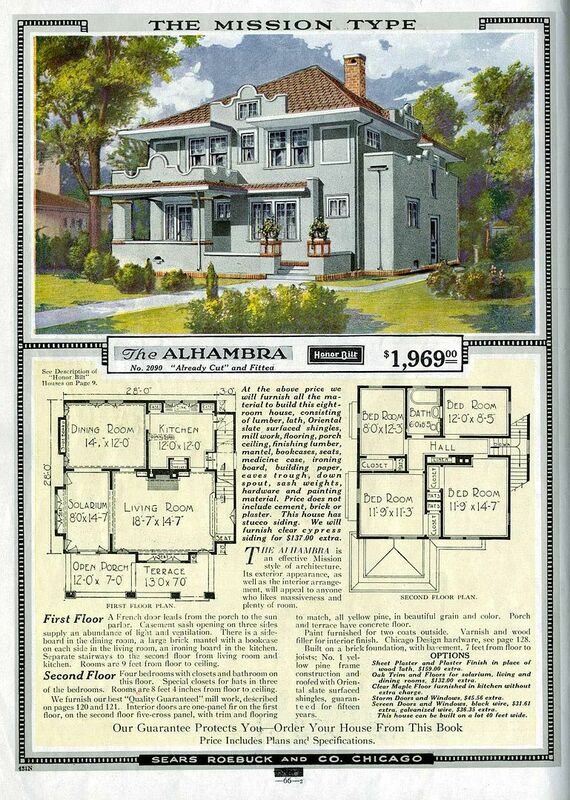 Aladdin was yet another mail-order company that sold entire kit homes through catalogs. Aladdin had a massive mill in Wilmington, NC which might explain why we have so many Aladdins here in Hampton Roads. 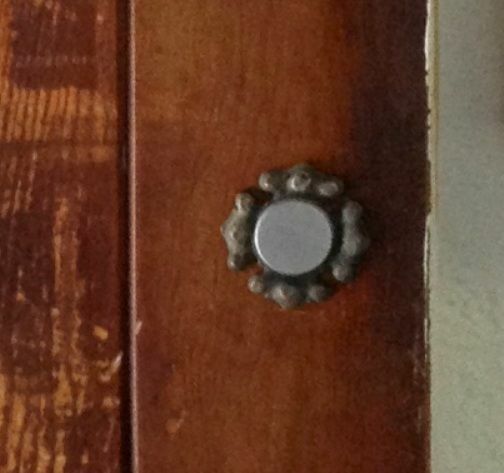 This is one of my favorite "finds," as it's such a beautiful match to the catalog picture above. The Aladdin Marsden was one of Aladdin's most popular homes. This Aladdin Marsden (in Westhaven) has had a lot of "improvements," but it's still easily identifiable as a Marsden. Portsmouth has one of the prettiest Marsdens I've ever seen. This beauty is in Port Norfolk. 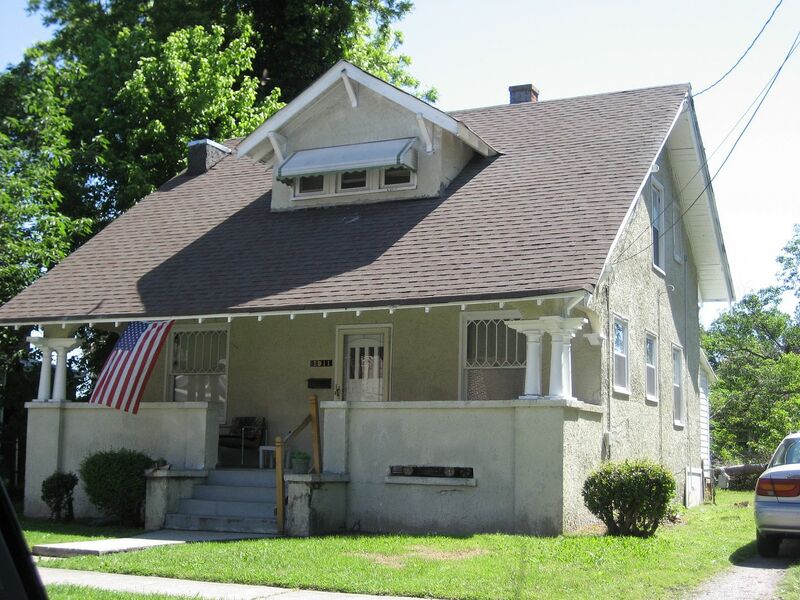 The Aladdin Pomona was another very popular house. 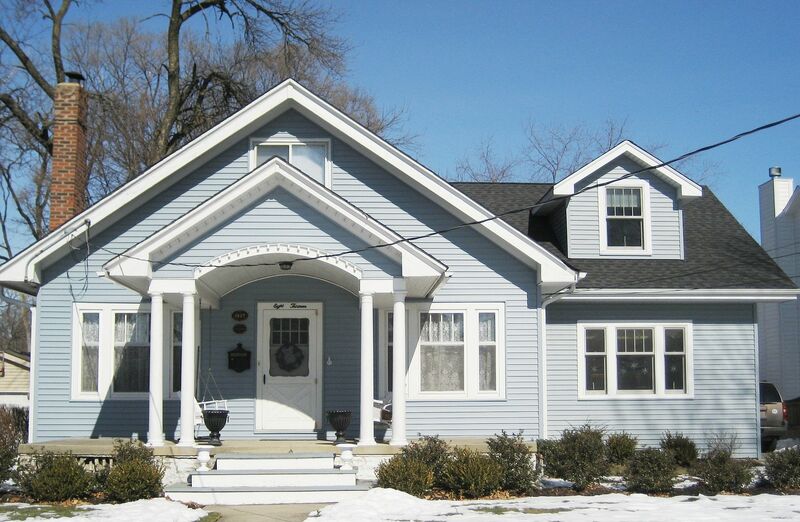 It was a classic bungalow with lots of attractive features. Personally, I love the diamond muntins. Located in Waterview, this Pomona has been remodeled, but it's definitely a little Pomona hidden under all those extra square feet of living area. This Pomona is in Westhaven. Sadly, I didn't have my chain saw with me when I got these photos, so the landscaping is presenting a bit of an obstacle. Remember I mentioned Tom Thornton above? 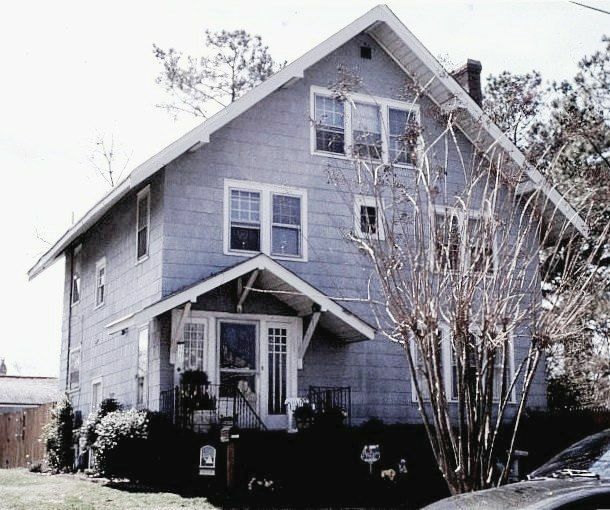 Tom's aunt and her husband (Betty Beal and her hubby Bobby) lived in this house for many years. And moving on down London Blvd, there are a few Sears Homes down in West Park View, too. 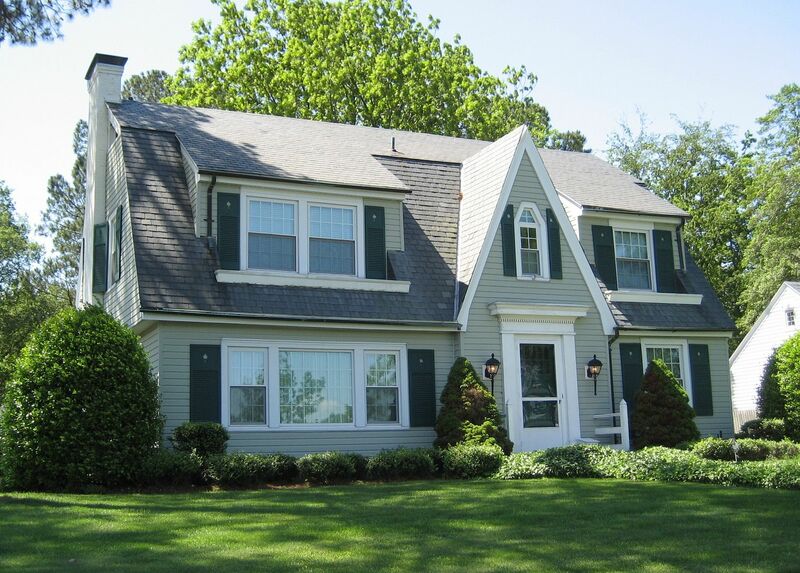 This Attleboro is in West Park View, and it's a real find. In all my travels, I've seen only FOUR Attleboros and to see that we have one in Portsmouth is pretty darn exciting! Also in West Park View there's a Sears Elsmore. This Elsmore is on Elm Street, which is pretty cool. There's another Elsmore on Turnpike Blvd, tucked away behind the trees. 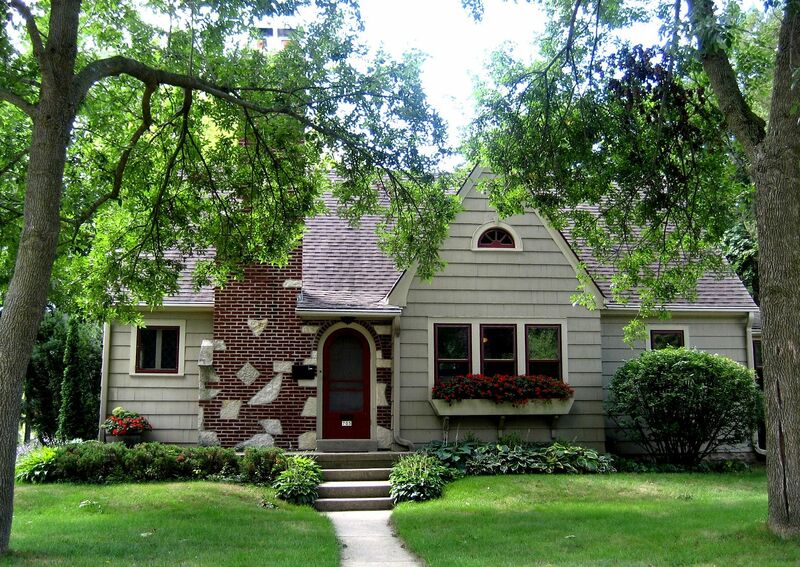 The Oak Park is a Dutch Colonial offered by Sears in the late 1920s and into the 30s. And there's an Oak Park in West Park View. 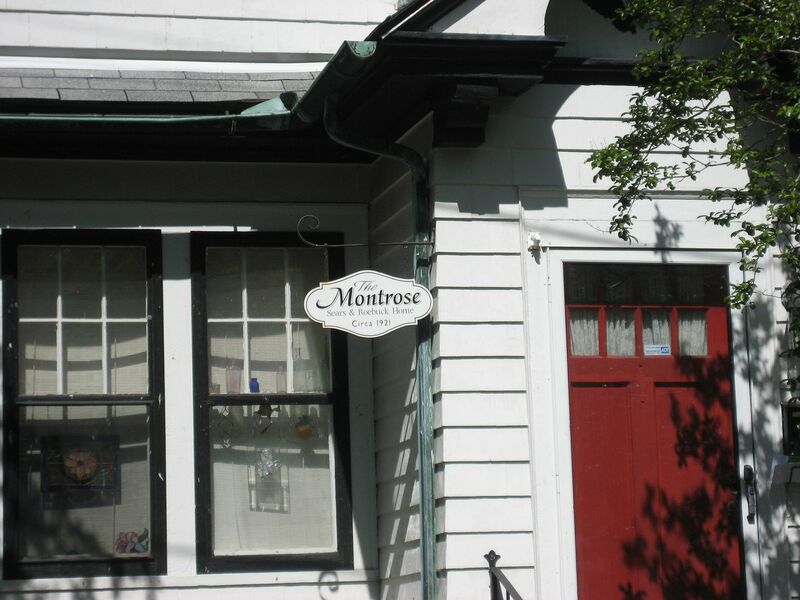 Just around the corner from the Oak Park is another unusual Sears Dutch Colonial, The Montrose. And it's a fine, fine house! And these folks appreciate their beautiful Sears Montrose! At the other end of Elm Street, there's an Aladdin Shadowlawn. I wonder if these folks know what a treasure they have? 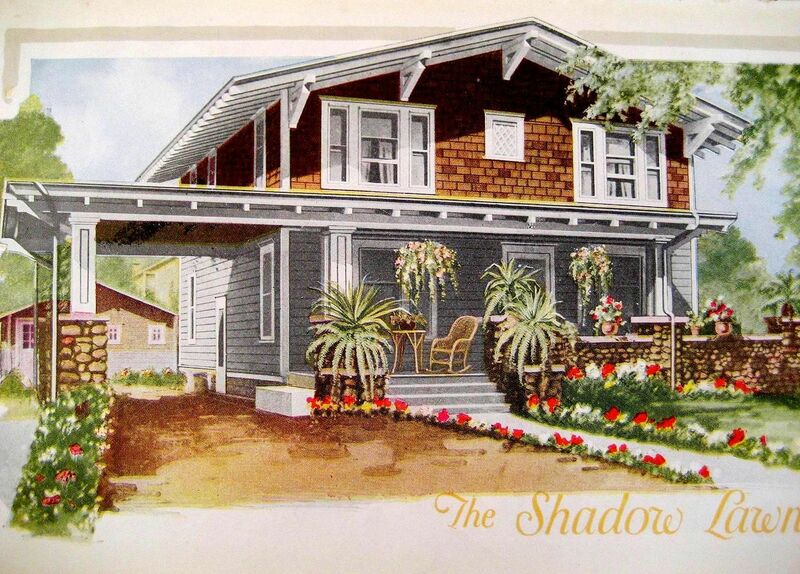 There's another Shadowlawn in Port Norfolk minus the porte cochere. Unfortunately, I could only get a shot from the one side, but it's a Harris Brother's Model #J-161. The other side has the polygon bay (as shown on the page above). Surprisingly, there are two Sears Alhambras in Portsmouth. This Alhambra (looking fairly decent despite the replacement vinyl windows) is in the 1500-block of County Street, It's surrounded by a sea of empty lots, so one wonders, how many Sears Homes bit the dust when this area was "redeveloped"? 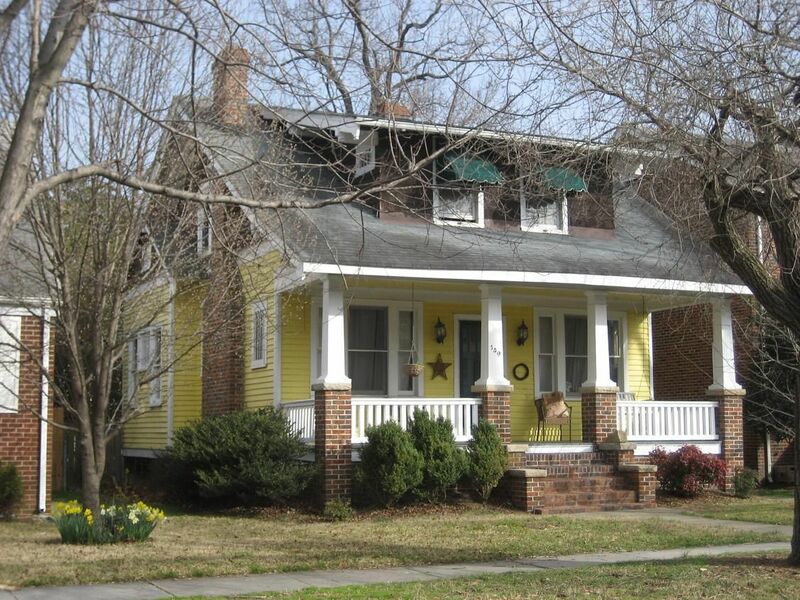 In 2002, I gave a talk on Sears Homes in Port Norfolk. Five people showed up. 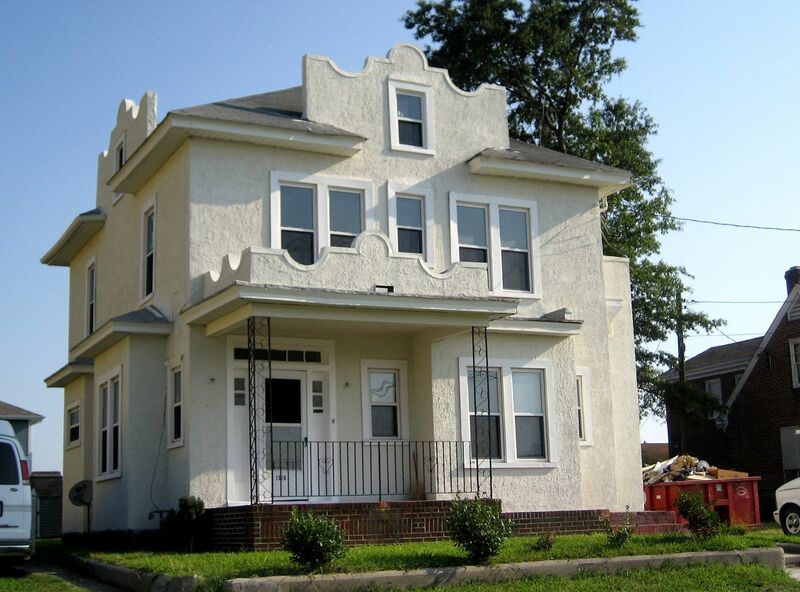 Two of them were the married couple that owned this Alhambra in Craddock. They have me the full tour, and it's a dandy of a house - inside and out. And also in Craddock, there's a Sears Uriel. It's been through some tough times, but it's still identifiable as a Sears Uriel. The Columbine (from the Latin word for “dove”) is Colorado’s state flower; it’s a perennial plant that grows naturally in meadows and forests. 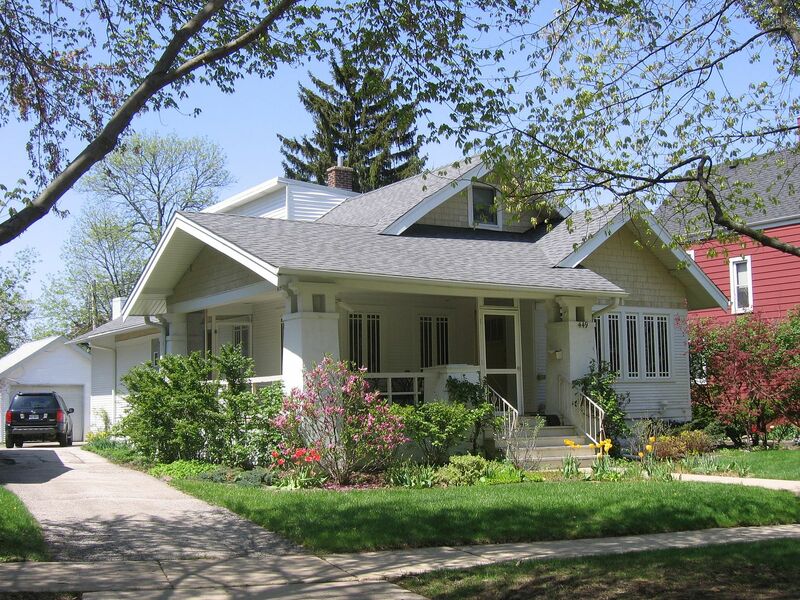 And it’s also a fairly unusual Sears kit house. The Sears Columbine has several unusual features, which makes it easy to identify. But this model was not very popular, which means you’re probably not going to find too many of them. 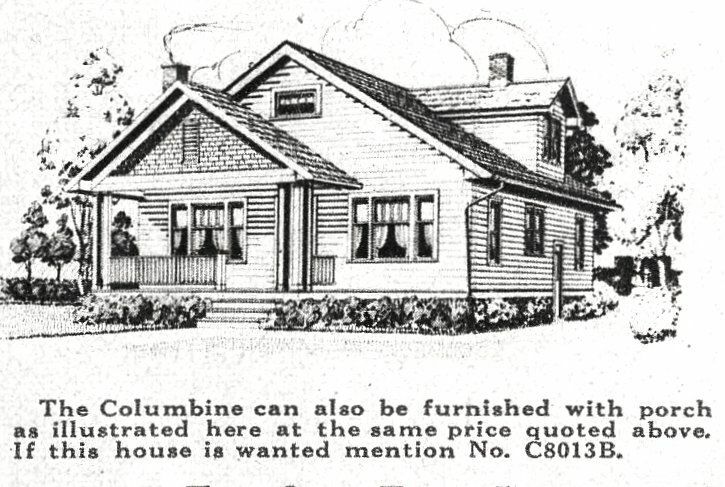 Sears Columbine as seen in the 1921 catalog. And the 1928 catalog. Notice it's a little different from the 1921 picture. 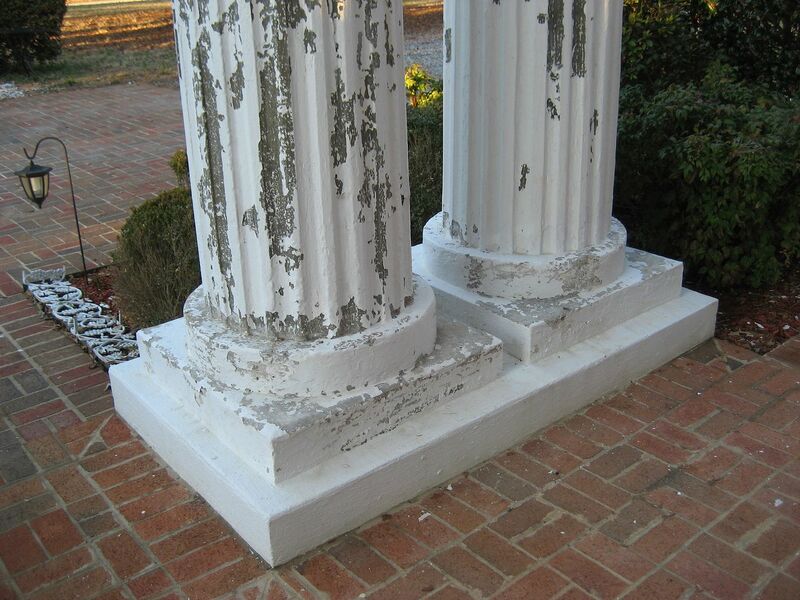 In 1928 (left) the dentil molding is gone. 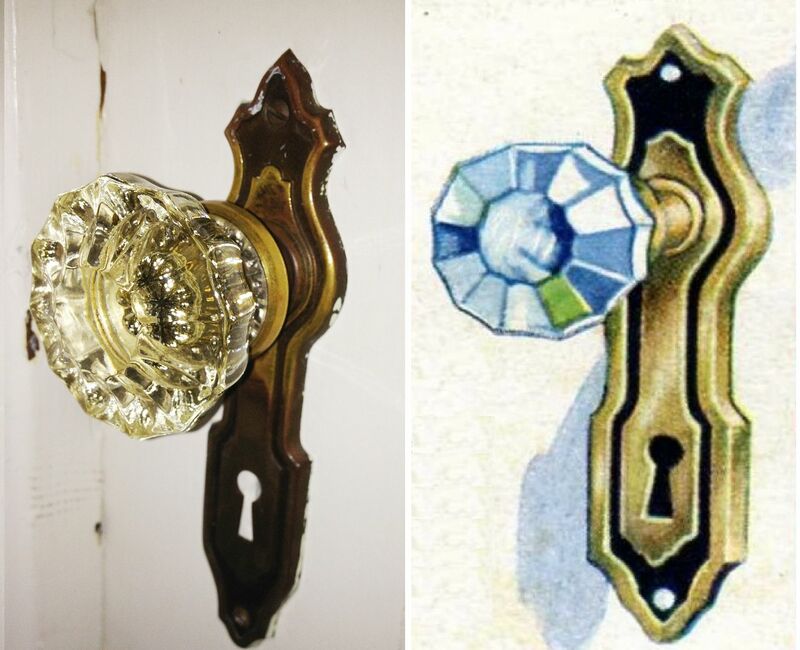 And interesting, the two catalog images (1928 and 1921) are from different angles. 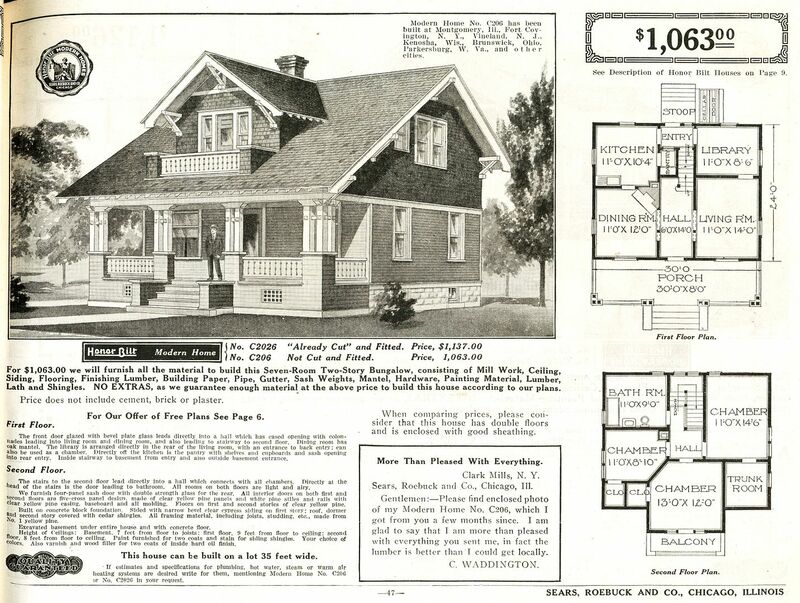 I don't think I've seen any other Sears catalog images that showed the house from two different angles in different years. 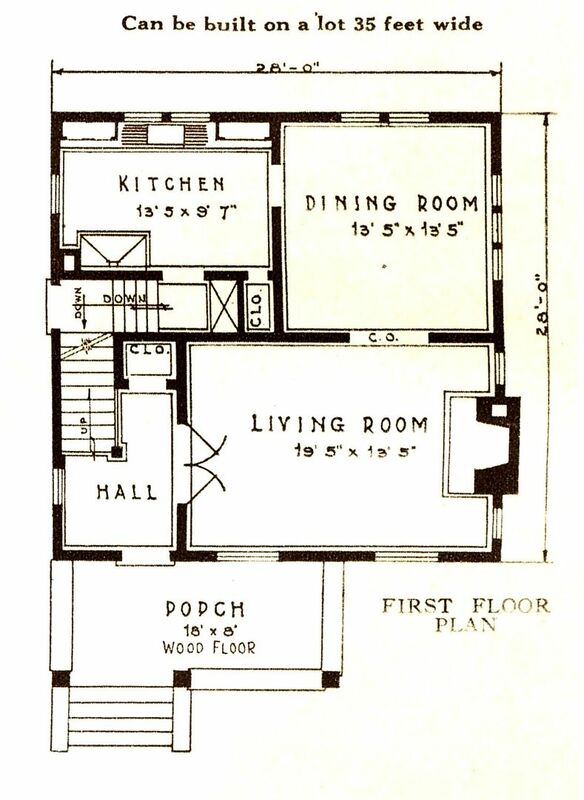 The floorplan in both 1928 and 1921 was the same. 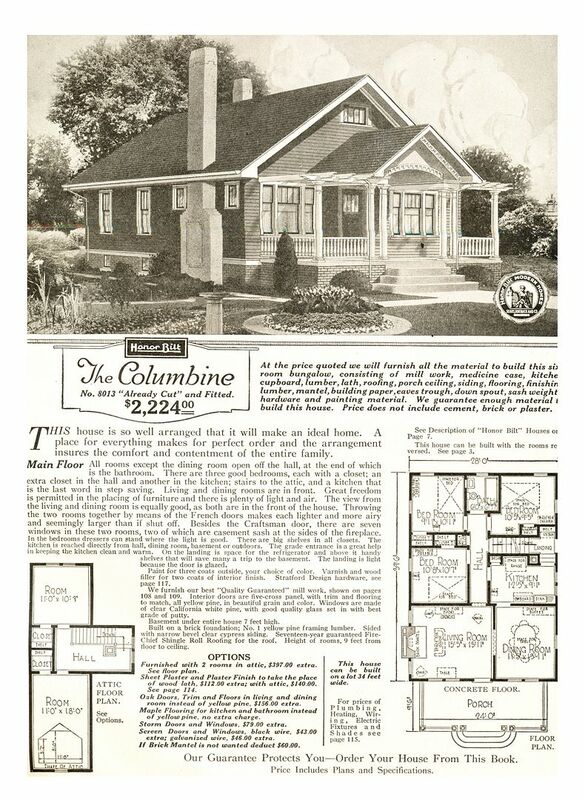 In the lower left of the 1928 catalog page was the slightly different version of the Sears Columbine. 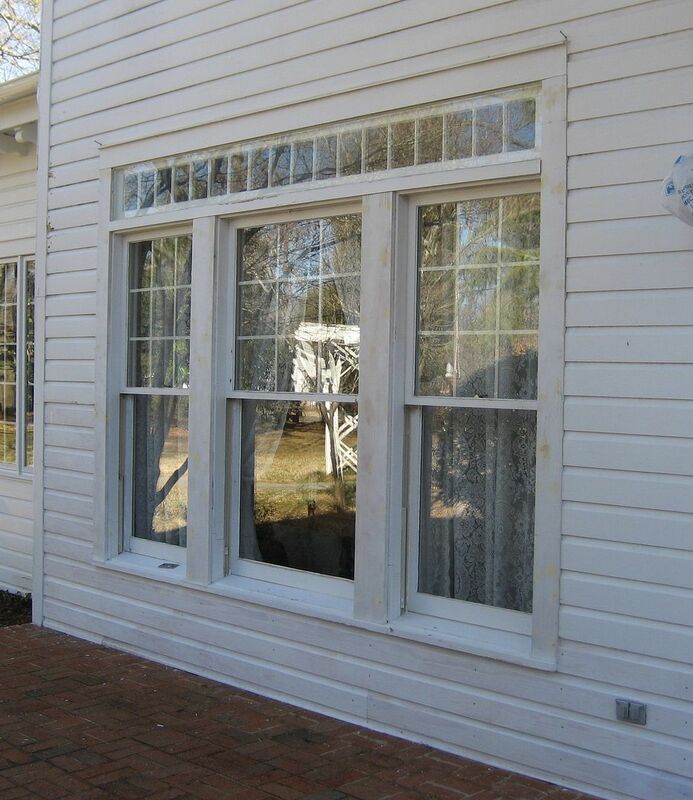 The front porch was the only difference between "A" and "B" models. Here's a Columbine (Model B) in Elgin, IL. 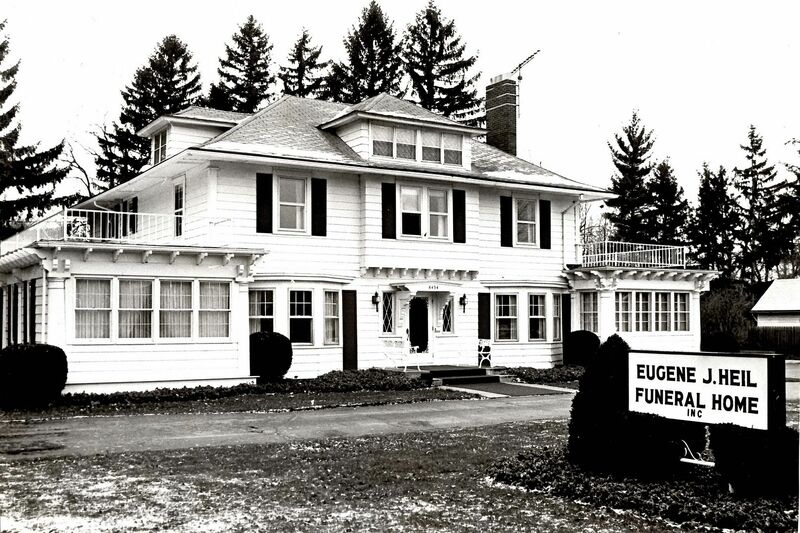 Rebecca Hunter has discovered that Elgin has more than 200 Sears Homes, making it THE largest collection of Sears Homes in the country. Photo is copyright 2010 Rebecca Hunter and can not be used or reproduced without written permission. To read about Rebecca’s newest book, click here. 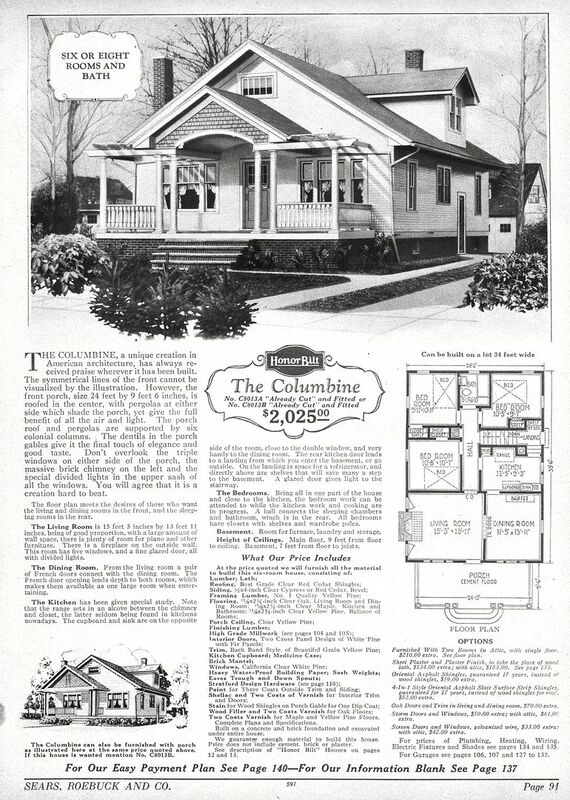 Sears Columbine, as seen in 1921. Here's a beautiful Columbine in Wheaton, IL. The large addition (to the right) was very tastefully done. The pretty Columbine from a slightly different angle. To read about Rebecca’s new book, click here.